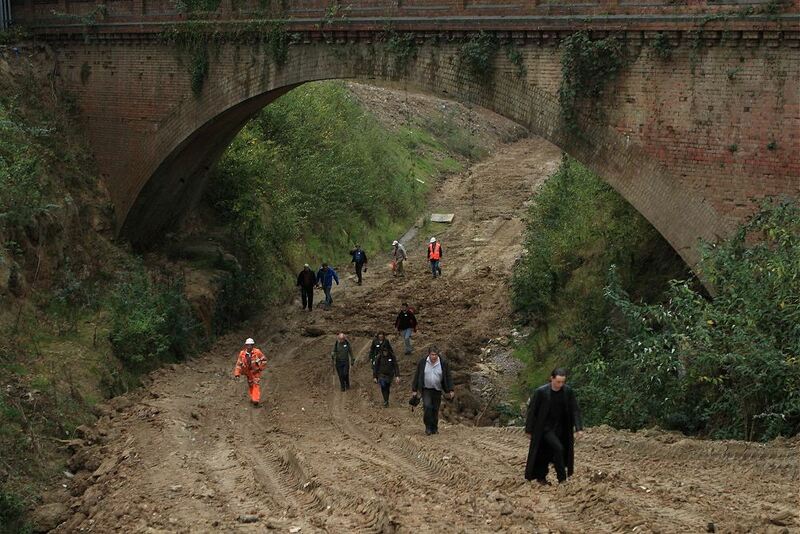 12 December 2011: Digging completed for 2011 - Report on "Waste By Rail 5". A total of 5119 tonnes of waste was removed during the first week of "Waste by Rail 5" (WBR5) and 5016 in the second week. We were able to extend WBR5 from 3 to 4 weeks, and during the last two weeks a further eight Waste by Rail trains ran, four trains each week. 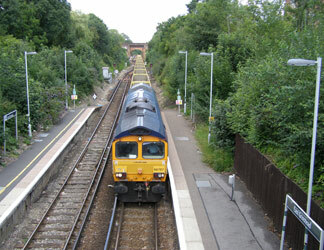 During the third week, on the Monday the train arrival was unfortunately delayed making it impossible to fully load the train before the scheduled departure time, and during the final week the Friday train was cancelled due to GBRf's contractual commitment to de-ice the track in the Southern and South Eastern Trains areas, their staff being placed on standby for these duties. The trains run during the final week were always going to be a bonus. 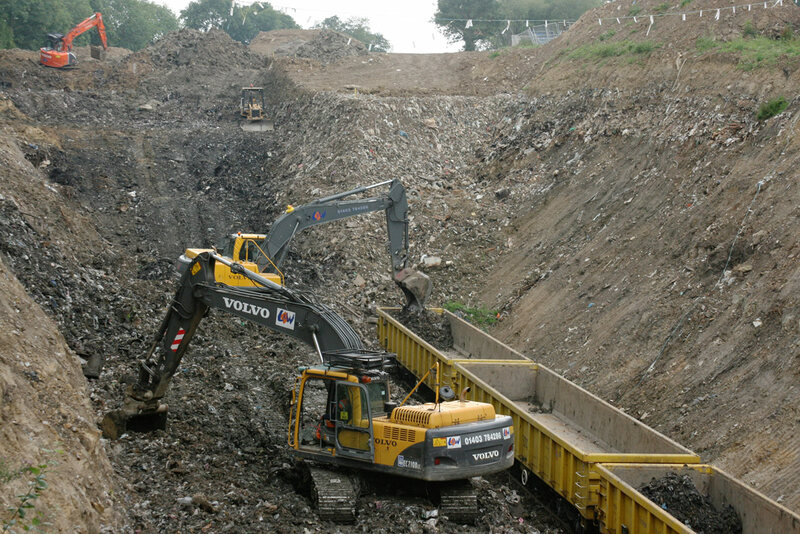 As at the end of the final week the grand total of waste removed by road and rail stands at 90,981 tonnes, but remember volume is more important than weight. The site will now be shut down until the New Year. 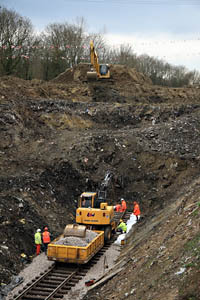 An assessment will be made early in 2012 to determine whether further waste needs to be removed before Landfill Tax becomes applicable (1st April 2012). 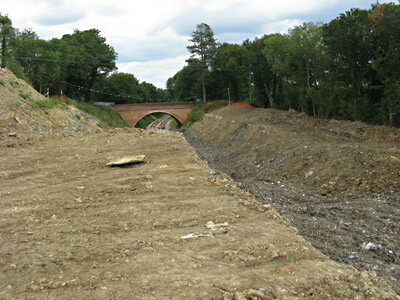 Meanwhile other preparatory work for the completion of the Northern Extension Project will commence. 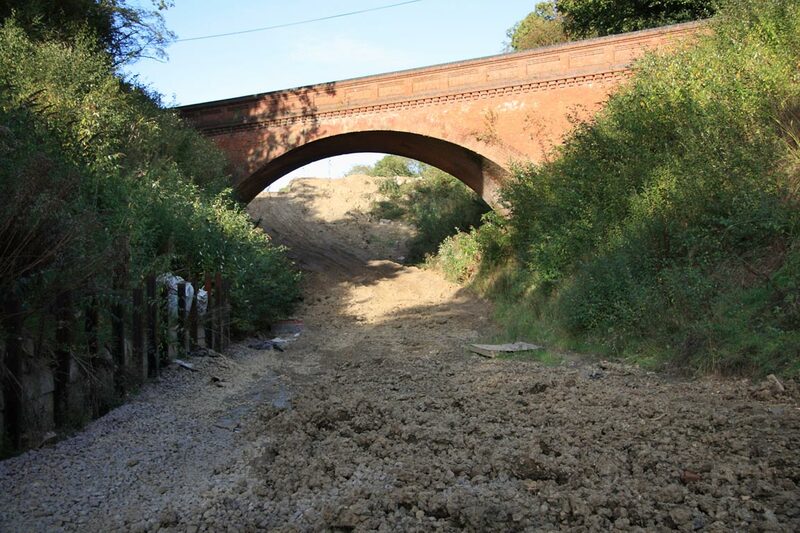 The photo on the left (from Nigel Longdon) was taken looking south towards Imberhorne Lane bridge on Friday 9th December. 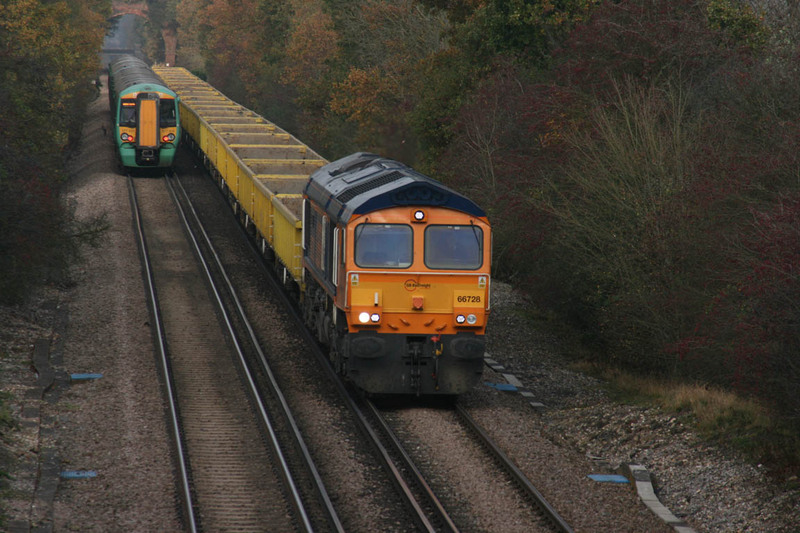 Tony Sullivan's photo on the right shows No.66728 running between Hurst Green and Lingfield with the incoming empties on Wednesday 16th November, midway through the first week of the "Waste by Rail 5". Above the retreating 377 in the far distance can just be seen the low steel-span bridge which carries the Redhill - Tonbridge line across the East Grinstead line, beyond the much higher brick-built farm occupation bridge. 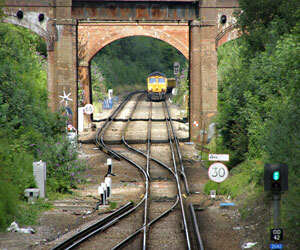 The Class 377 is working the 13.07 East Grinstead to London (Victoria) service. 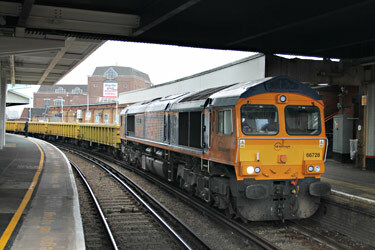 The same day Barry King met No.66728 at Clapham Junction, as seen in the photos below, and this video. Mark Armstrong happened to be at Willesden Junction on Wednesday 30th November just as the empty waste train was passing, heading in our direction behind No.66722 'Sir Edward Watkin', and managed to get this video. Makes you realise just how long our train is! Ashley Smith has a photo taken at Dormans of the incoming empty train the following day. together with subsequent donations and Gift Aid, has now exceeded £100,000. since we still need to raise a lot more money to complete the extension. (to which Gift Aid will be added) in just 11 minutes this morning! 5-9 December 2011: The Big Give - Fund Raising. As has been stated previously, we still need just under a million pounds to complete the extension to East Grinstead. As part of our fund raising, we have been accepted for the Reed Foundation's "Big Give" Christmas Challenge which enables us to obtain some match funding for the extension. What we have to do is raise £30,000 in 5 days (starting at 10am each morning) through the Bluebell's page on the Big Give web site. Any donation made this week will be matched POUND FOR POUND by a combination of our major supporters and the Big Give's sponsor funds. If you are eligible for Gift Aid as well, this will, for example, turn a £10 donation into £22.50 for the extension project. We really need your help this week! Stop Press Wednesday 7th Dec: The Big Give Christmas Challenge: Looking at our current position, it's apparent that we're in competition with some big players, and we need to raise the final £7K today, as soon after 10am as possible, to ensure we get the £7K match funding. If you were intending to donate over the last couple of days, please do try again from 10am this morning. We are aware of some continuing problems with the Big Give web site, particularly yesterday that it sometimes took several attempts for the site to accept donors' card details. Thank you for your patience. Note: Match Funding is available from 10am each morning until the funding available for that day is all used up, so please be aware that donations made after that time may not be matched. A new tranche of matching funding becomes available at 10am each morning. Stop Press Tuesday 6th Dec: We have so far raised a staggering £46,157 in donations and match funding, plus £4,563 of Gift Aid to come. Many thanks to all who have donated. Because we have now reached our match-funding limit for the first two days, there is no more match funding available to us until 10am tomorrow morning. 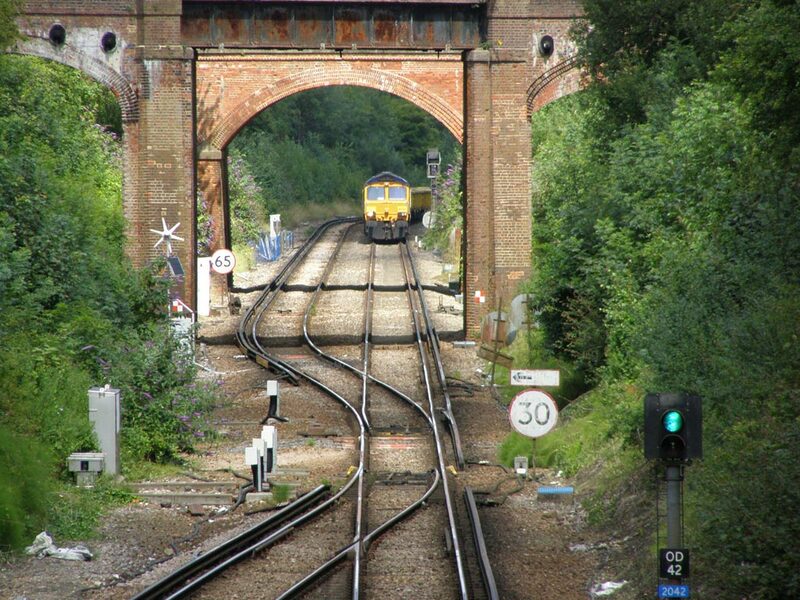 Go That Extra Half Mile With the Big Give, 5-9 Dec.
Over the last few years we have made a series of unprecedented appeals for funding the extension of the Bluebell line to East Grinstead, and you have responded magnificently. Well, the end of the waste extraction phase really is in sight. By donating online, starting 10 a.m. each day this week, you can help fund this final push. Any donation to this project made online to the Big Give (and not directly to the Bluebell Railway) during this drive will be matched pound for pound by an equal combination of our major donors and the Big Give sponsor fund. To donate, click here. 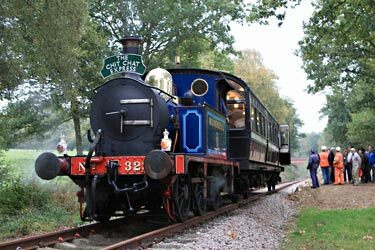 Please consider "Gift Aiding" your donation to increase its value to the Bluebell Railway; an option box can be found on the Big Give donation page. The Big Give's sponsor funding is not exhaustive, and they allocate it on a daily basis, so to guarantee their 50% match, it is best to make a donation as near to 10 a.m. as possible, on any of the five days (5 to 9 Dec.) The opportunity ends after five days, and our target is £30,000 in online donations. You can follow our progress 'live' on the Big Give website. We know the call for funding this project has pushed your generosity to the limit, especially in the current economic climate, but with a landfill tax imposed deadline of 1 April, 2012, now is the time to really make the extension happen! 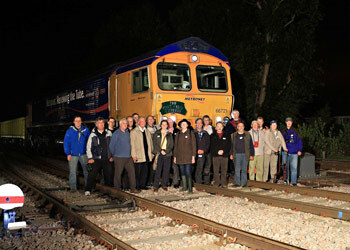 14 November 2011: The start of "Waste By Rail 5". The longest yet phase of waste removal works (WBR 4) finished on Tuesday 2 November and comprised 5 weeks of train operation removing a total of 25,000 tons. As predicted this has resulted in a significant change to the cutting shape which is very evident from on the site itself but less so from either of the bridges. 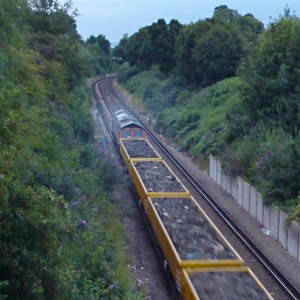 WBR 5 is due to commence on 14 November, running for 3 weeks, which should remove a further 15,000 tons and will complete the current requirement for waste trains. Any residual trains that are required will run next year. 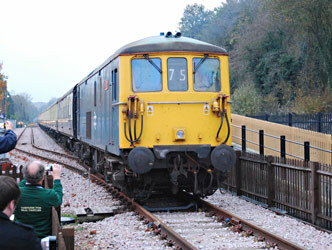 Sutton Courtney near Didcot was the destination for WBR4 trains as it will be for these trains. 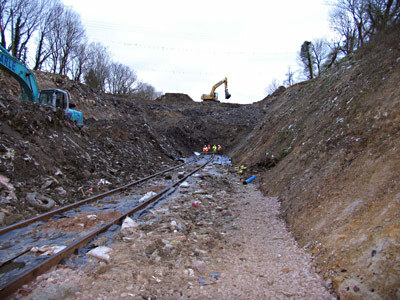 Once WBR5 is finished, some plant will remain operating on the cutting site for a while, carrying out tidying-up tasks but no significant works are planned until next year; winter weather conditions combined with reduced daylight hours are not conducive to efficient site operation. Infrastructure resources will then concentrate on the North end of Kingscote during March 2012, with vital permanent way improvements necessary to pass regular passenger trains over the single line junction. Once installed, this will enable the S&T engineering team to get under way with the extensive alterations required to control the East Grinstead - Kingscote section from the present Kingscote signal box. 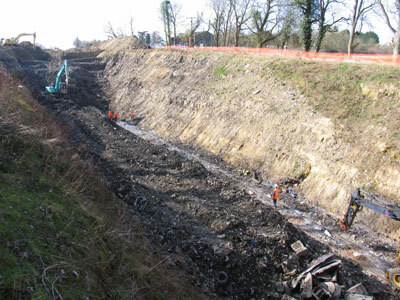 On resuming work at Imberhorne Cutting the focus will be on stabilising and profiling the residual material so it looks like a traditional railway embankment. 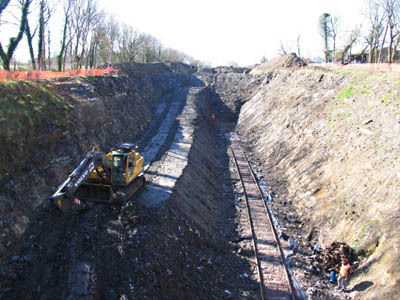 When this is complete the track bed itself will be prepared along with the necessary track drainage and cable ducting routes. 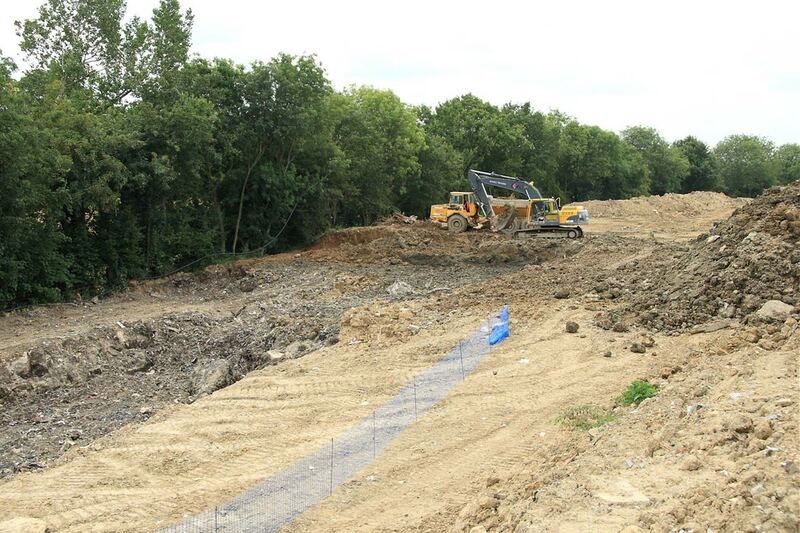 A dedicated drainage system will also run through the cutting to capture any leachate flow from the residual waste. Next the permanent way itself will be constructed sometime around August / September 2012. Once we have a railway operating through the cutting it will then be possible to economically transport the stockpiles of capping material away from Imberhorne Lane southwards for use elsewhere on the railway. This is essential before any regular train service can commence operation. 7 November 2011: Notice re. 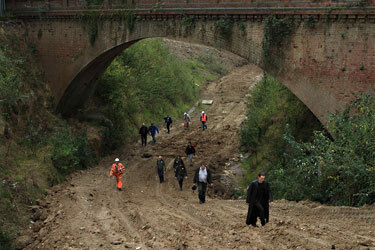 problems of access at Hill Palce Farm bridge. A note for anyone who might consider visiting Hill Palce Farm bridge to view work on excavating our tip, following a complaint from one of the farmers that his access was recently blocked. The metalled road that leads from Turners Hill Road is private though it does form part of a public footpath. No one should park their car anywhere in the lane or on the hard stand in front of the business premises. If you want to view the tip from Hill Place bridge then park on the main road and walk along the footpath (you'll need sturdy footwear especially if has been raining recently). The issue with parking in the lane is becoming an increasing problem. We need to be on good terms with our neighbours and if visitors coming to view the work create a nuisance this will undermine that relationship. 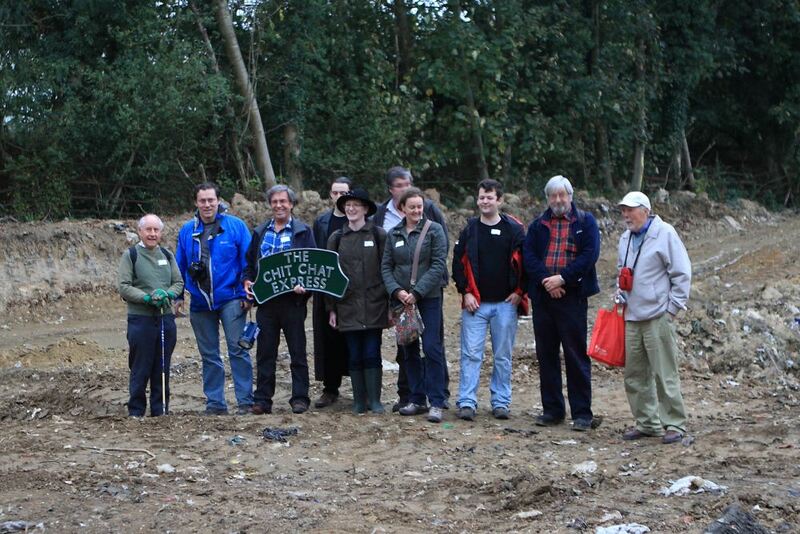 5 November 2011: "Mine of Serpents" tour at East Grinstead. 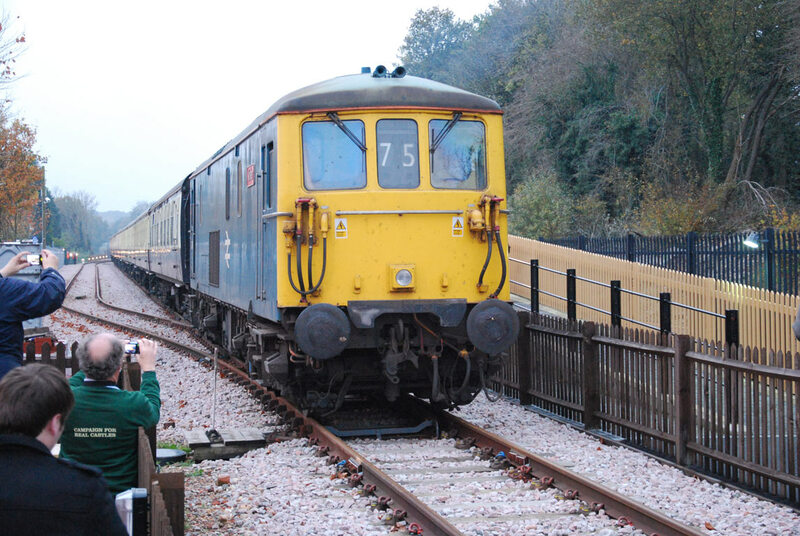 On the afternoon of Saturday 5th November 2011, the "Mine of Serpents" train tour arrived at East Grinstead, where it visited the Bluebell Railway's northern extension. 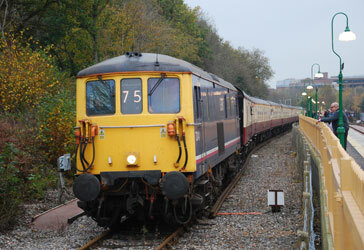 This train consisted of ten coaches, top and tailed by class 73 locomotives, 73141 "Charlotte" and 73208 "Kirsten". 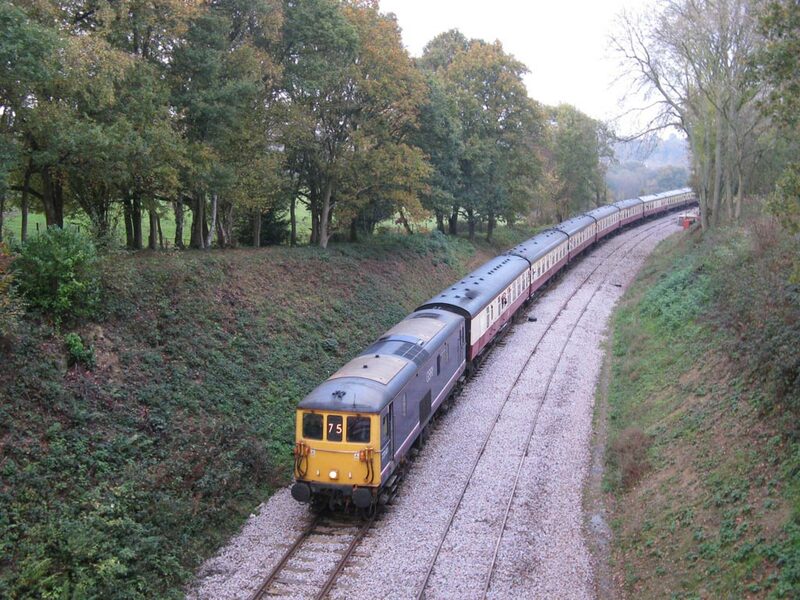 Patrick Plane's photo below catches "Charlotte" leading the special onto Bluebell metals at East Grinstead. The train then proceeded down the line, as seen in Stephen Fairweather's photo, approaching Hill Place Farm Bridge at the northern end of Imberhorne Cutting; is this a taster of things to come? The tour organisers kindly held a raffle on the train for Bluebell Extension funds, which raised about £1,000, and we raised about a further £1,500 through the opening of the station platform at East Grinstead, including the receipt of one substantial donation, so that's another 100 tonnes of waste removal funded! Patrick Plane's next photo below shows that Kirsten next led the tour train into our platform, and the special was stopped with the leading coach fully in the platform, although fouling the run-round loop point, which of course was not needed on this occasion. Stephen Fairweather's next photo shows the South end of the train, with "Charlotte" and the tenth coach, plus part of the 9th just off the end of the platform. 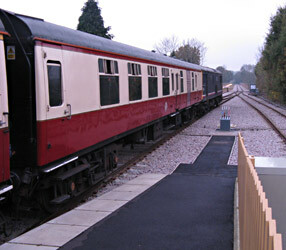 We can therefore now confirm that our new platform is able to comfortably hold eight and a half coaches! 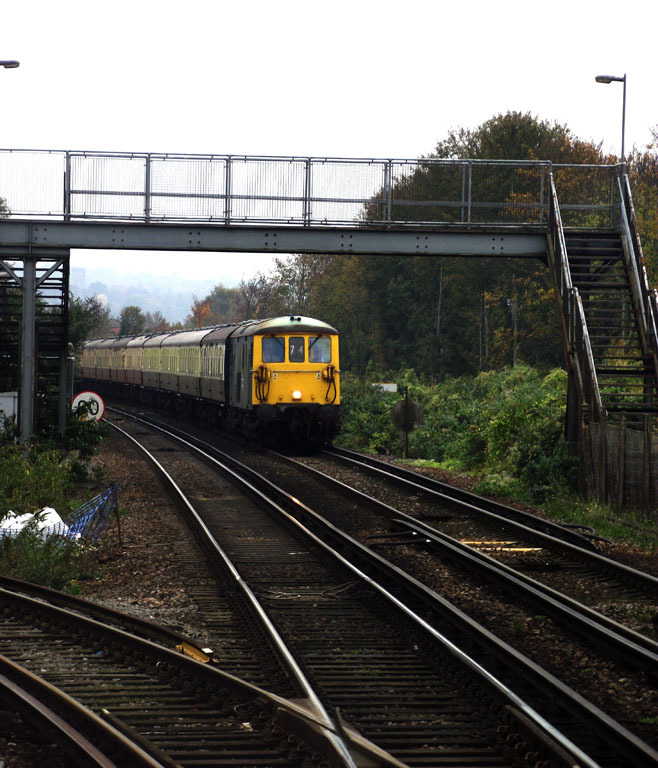 Finally, Nathan Gibson's photo shows 73208 leading the way back North through Purley. He also has a few other photos of the special. 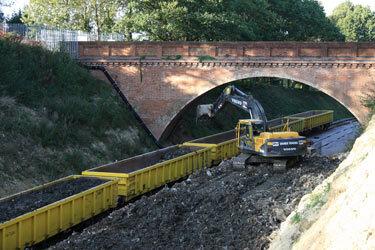 October 2011: Reports on Weeks 2, 3, 4 and 5 of "Waste By Rail 4". What's New Blog and on our Facebook page. They are brought together here to ensure the whole story is presented on this News page. On 31 October, GBRF loco 66722 'Sir Edward Watkin' and 20 MLA wagons took 1026.65 tonnes of rubbish away to Appleford. 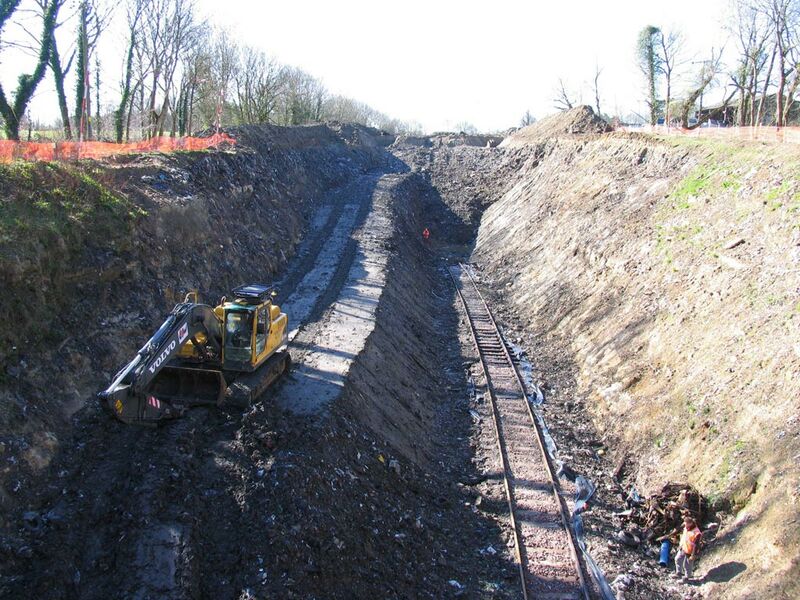 1st November is the final day of the "Waste by Rail 4" operation on the extension. All being well, we are now about three-quarters of the way through removing the tip material that is planned! John Sandys has some photos from 1st November, and recorded some of the activities on the last day of WBR4, with videos showing the first stage each day, the transfer of rubbish excavated from the cutting northwards to the loading point, then the empty train arriving and being loaded; finishing loading of the first three wagons, which are then shunted clear of the loading area. During week five of "Waste by Rail 4" a total of 5134 tonnes was removed, with all wagons being loaded close to the maximum capacity. The current phase concludes with further trains running on 31st October and 1st November. 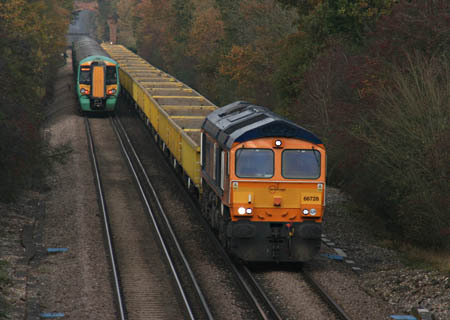 Greg Wales' photo on the left shows 66721 'Harry Beck' with half a train loaded on 28 October. With just two more days digging in the current phase of the project, we'll then be preparing for the final push (both in terms of digging and fund raising). Gordon Callander's photo below from Monday shows that we are now loading the wagons three at a time, since that reduces the distance the rubbish has to be moved once it is deposited in the loading area by the dumper trucks. To enable the positionning of one of the diggers to the south of the "pile", an addition length of track was laid over the previous weekend. 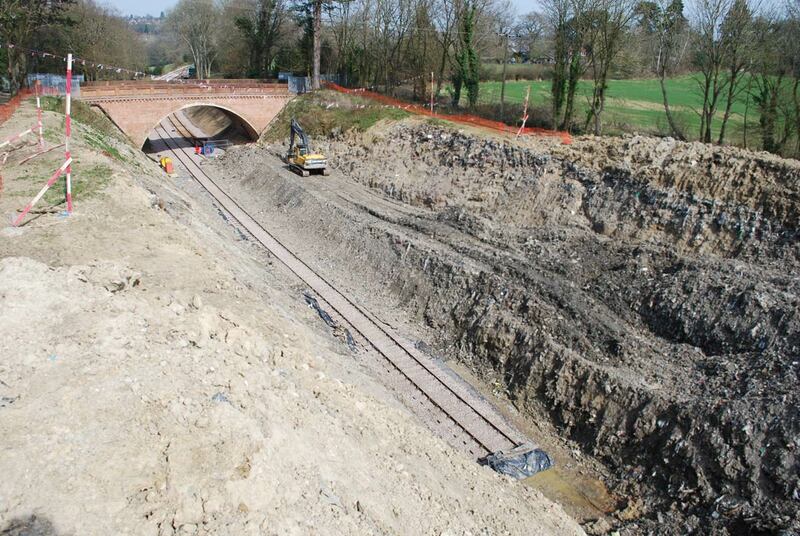 Robert Hayward's photo shows the slightly extended track. 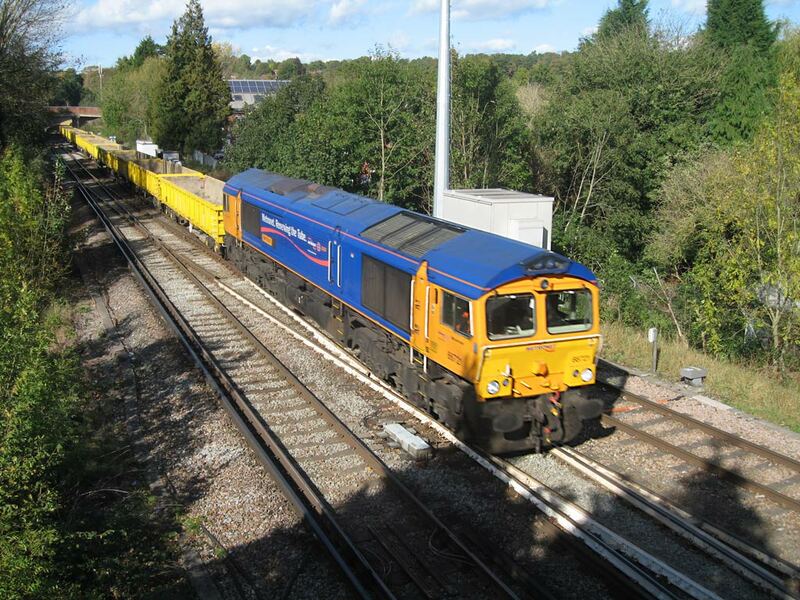 Robert Hayward's photo (right) shows No.66721 'Harry Beck' hauling the empties over the new Network Rail trackwork as it approaches platform 1 at East Grinstead with 20 empty wagons early on Monday afternoon, 24th October. The photo shows the recently doubled section of track just to the north of the platforms, which replaces the single-lead approach to the platforms. The last wagons of the train are just on the further of the newly installed crossovers. 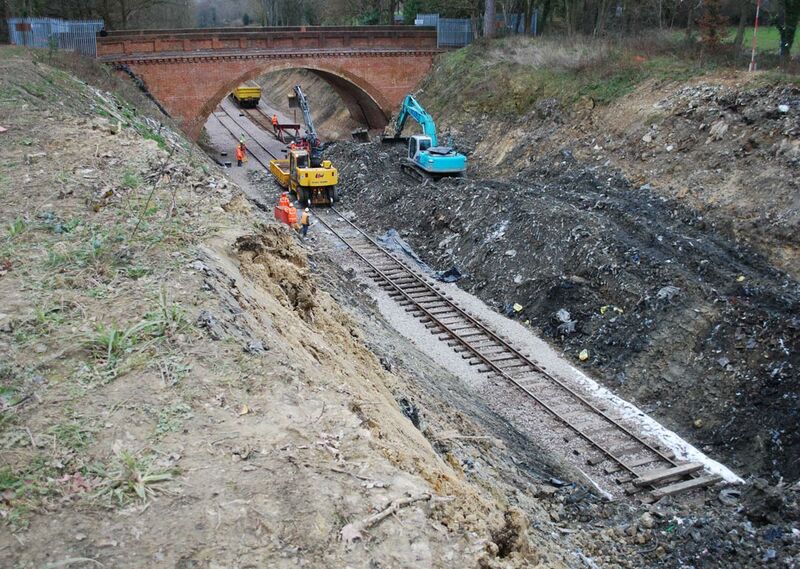 This engineering work both increases track capacity at East Grinstead, and paves the way for the forthcoming platform extension. Compare the scene with Malcolm Porter's photo from 3 months ago. Since this photo showing the recent track changes by Network Rail north of East Grinstead station have generated some interest, Chris Morris has posted lots of pictures of the crossover being built up on the site of St Margaret's Junction and then installed. 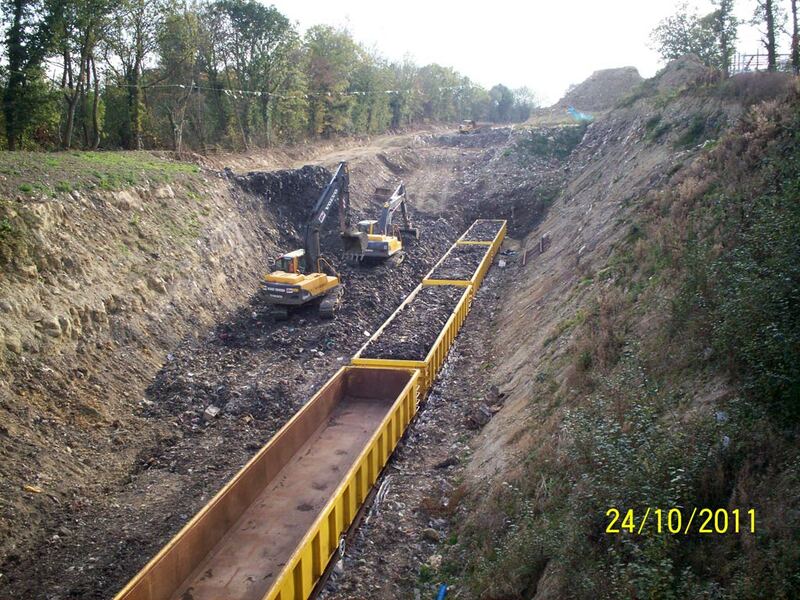 Chris says "It was very interesting to see how Colas Rail built both crossovers in a clearing at St Margaret's, then jacked up the complete panel and moved them both 100's of yards up the line. 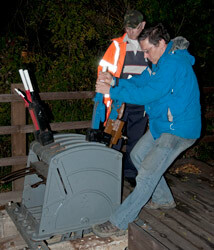 Unfortunately the final lift took place late on the Saturday and it was took dark to get a decent picture." A newly updated version of the appeal video is now available, as seen above. It reports that we still need just under a million pounds to complete the extension, with the urgency being to raise half of that by Christmas so that we can complete the clearance of enough rubbish by the end of the Landfill Tax Exepmtion, at the end of March 2012. Donations to the appeal, large and small, are urgently sought and may be made by various routes - online, by phone or by post. UK taxpayers can Gift Aid their donations to increase their value to us, and US taxpayers may do similar via the American Fund for Charities. Another 5028 tonnes of waste were removed during the fourth week of WBR4. On Monday and Tuesday one wagon was unavailable for use but this was swapped out Tuesday night whilst the train was en-route to Appleford. The current planned excavation is being extended by two days to account for the two lost days during the first two weeks. The same loco (No.66721 'Harry Beck') has been used for the fourth week. 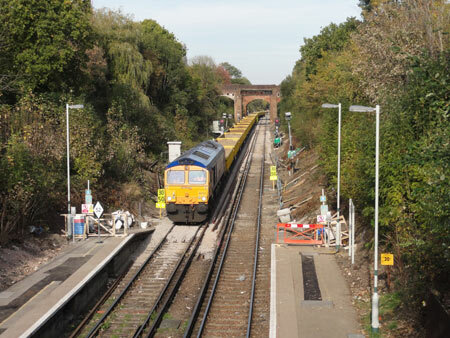 Brian Kidman's photo on the left shows the incoming empty train passing Hurst Green on Tuesday 18 October. 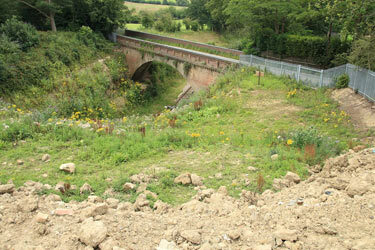 During the third week of "Waste By Rail 4" a further 5122 tonnes of waste was removed from Imberhorne Cutting. This brings the total of waste removed to in excess of 60,000 tonnes. This was the first week that we were able to run five trains with twenty wagons and thus it achieved the highest weekly total of the project. Progress removing the waste continues to run to schedule. On Thursday the departing train carried a "Chit Chat Express" headboard in recognition of the fundraising efforts of the members of the Bluebell Yahoo! forum on the Internet; in fact they have raised more than enough to cover the cost of two trains. 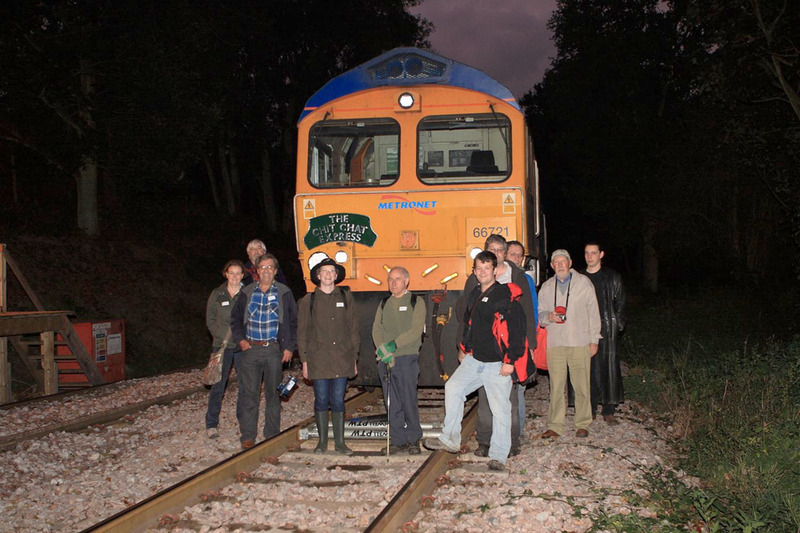 Below is a sequence of photographs showing the early evening run of the "Chit Chat Express" from Sheffield Park to Imberhorne South, where the headboard was carried over the tip by members of the Bluebell's Yahoo! 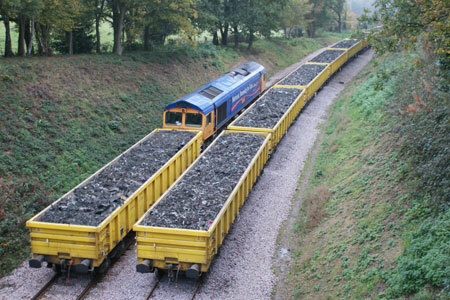 e-mail group, and placed on "their" train carrying 1000 tonnes of rubbish away on the main line. The e-mail group members have so far raised enough money to pay for a second waste train, and are currently fund-raising for the 3rd. 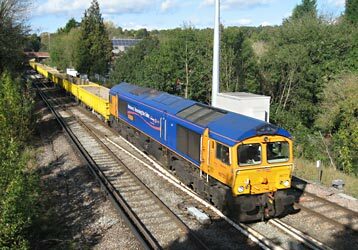 The first photo, from Nathan Gibson, actually shows 66721 'Harry Beck' working the incoming empties through Riddlesdown 4 minutes ahead of Schedule on Tuesday this week. 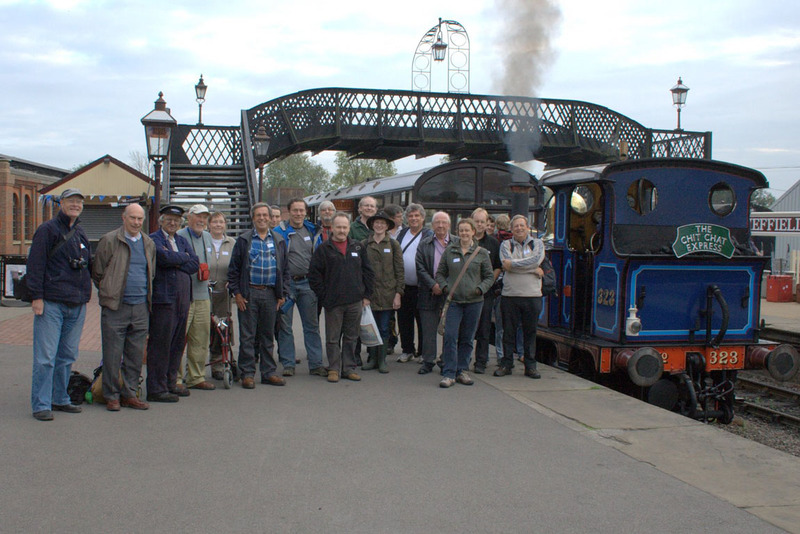 Chris Knibbs took the next photo on John Sandys' camera, showing the assembled party at Sheffield Park for the ride up to Imberhorne South. 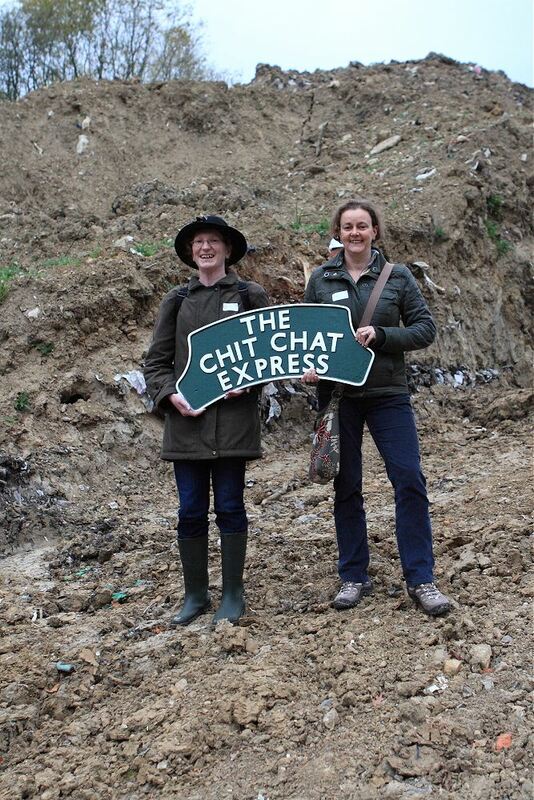 Mike Hopps has a sequence of photos, the first showing the Chit Chat Express having arrived at Imberhorne South, with the tip walkers disembarked. Walking up the slope at Imberhorne Lane bridge. 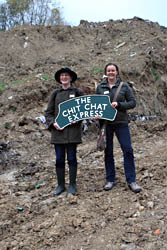 Headboard bearers Deborah Salmon and Lorna Webb deep in the rubbish! 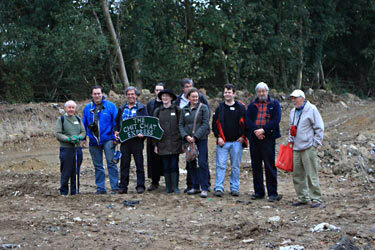 The tip-walking group in the middle of the tip. Headboard now on 66721 'Harry Beck'. 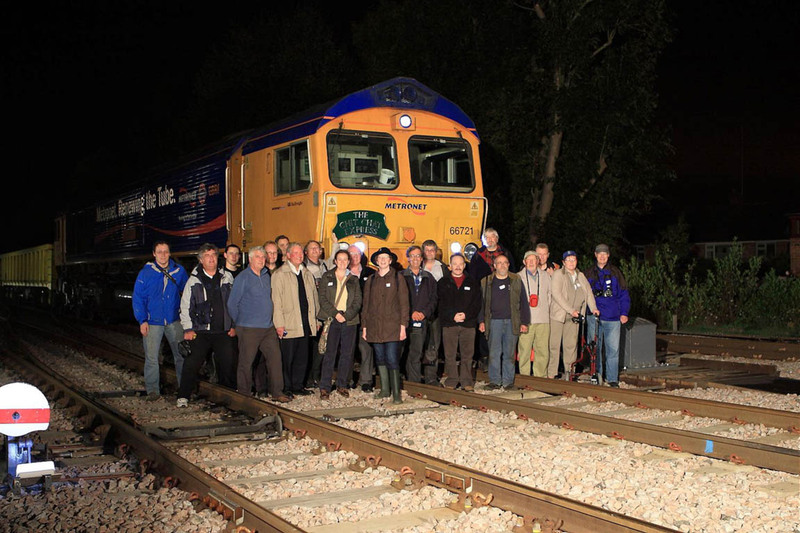 Those who had also arrived by road (the tip-walking group was limited in numbers) pose at EG station before the waste train's departure. 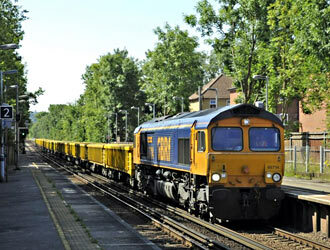 Richard Salmon's photo shows 66721 ready for departure in the throat of the Bluebell's platform at East Grinstead. Martin Lawrence's photo shows Dave Clarke, winner of the raffle, operating the ground frame under the supervision of Pat Page. In addition there are photos from Martin Lawrence taken at East Grinstead, and John Sandys, whoi also supplies the following videos: Group at S/P before leaving: , Chit-Chat Express leaving S/P: , Chit-Chat Express heading North: , Through H/K: , Leaving K/C, through the gate onto the extension , and on up to Imberhorne South . 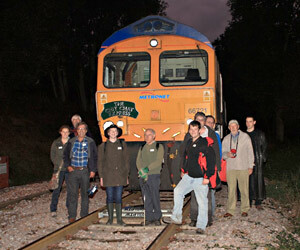 Dave Clark has a sequence of photos of the "Chit Chat Express" evening, as has Ken Upton. During the second week of "Waste By Rail 4" further progress was made with an additional 4128 tonnes being removed - all wagons departed well loaded (remember it's volume not weight). The total waste now removed is about 55,000 tonnes. 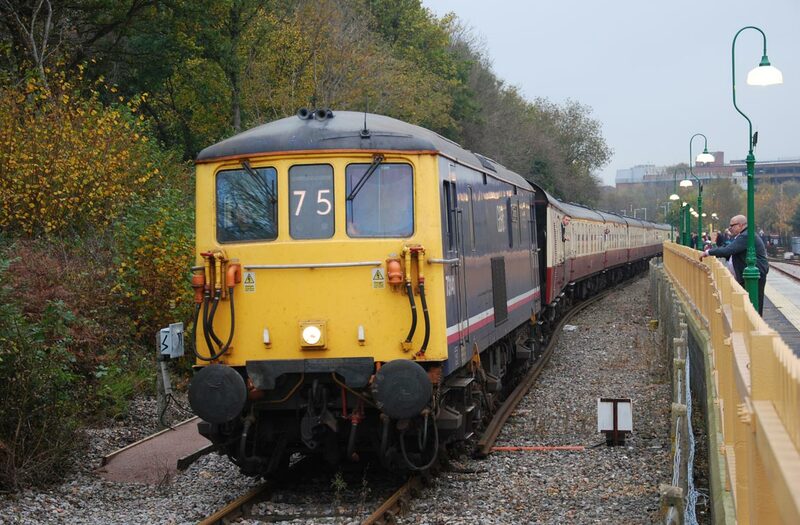 Unfortunately due to a contractual commitment to London Underground GBRf were unable to provide us with a train on Friday 7th. Once again we will catch up later, since the path can be rescheduled. Mike Hopps' photo from Wednesday 5th October shows 66708 "Jayne" backing the empty rubbish wagons into the loading area at Imberhorne North, part-way through our second week of "Waste by Rail 4" work on the Extension. 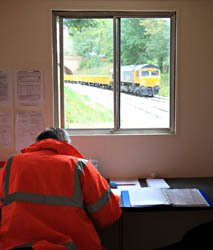 Mike's photos below show some of the less visible aspects of the "Waste by Rail" operation: Clive in the loading cabin doing the paperwork after a weigh, and the computer connected to the weighbridge which calculates and prints out the weight of each loaded wagon. 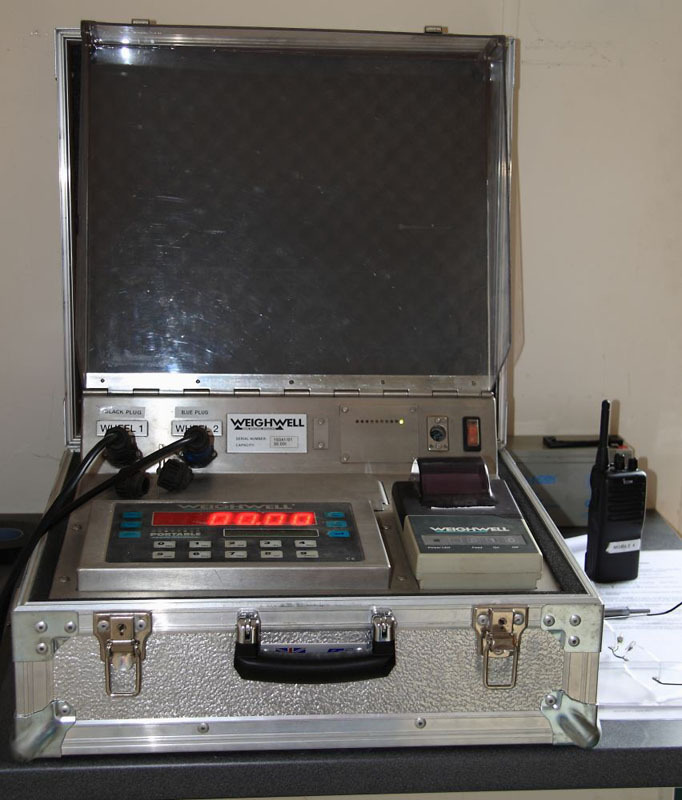 The weights are then listed in the manifest and this is either faxed or travels with the train. 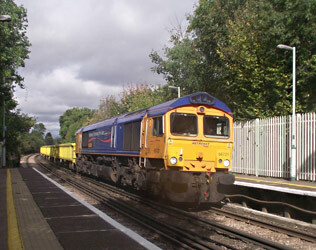 End of September 2011: First week of Waste By Rail 4. 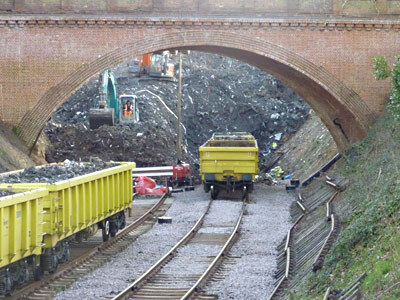 The first week of Waste By Rail 4 has now been completed. Unfortunately we were able to only run four trains as the locomotive was failed on Monday evening and there was insufficient time to source a replacement and get the wagons unloaded in time for their scheduled return on Tuesday. We are not concerned with the loss of this train as there will be ample opportunity to run an extra train during the next excavation. The total for this week was 3957 tonnes, bringing the total removed above 50,000 tonnes. Now that the waste is some distance from the loading area two large dumper trucks are being used to move it prior to the arrival of the train each day. 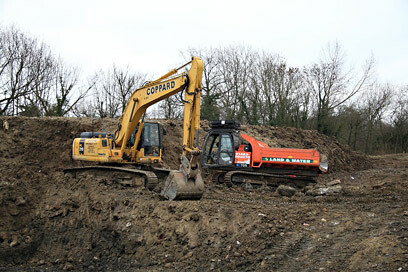 One of the pair of excavators loads the dumpers whilst the other arranges the loading area. When the train arrives both excavators load the wagons. Just under £1M is required to complete the project. Approximately half of this is required by January so that the waste can be removed prior to 1st April 2012 to avoid having to pay Landfill Tax. If you wish to help us please go to details of our appeal. 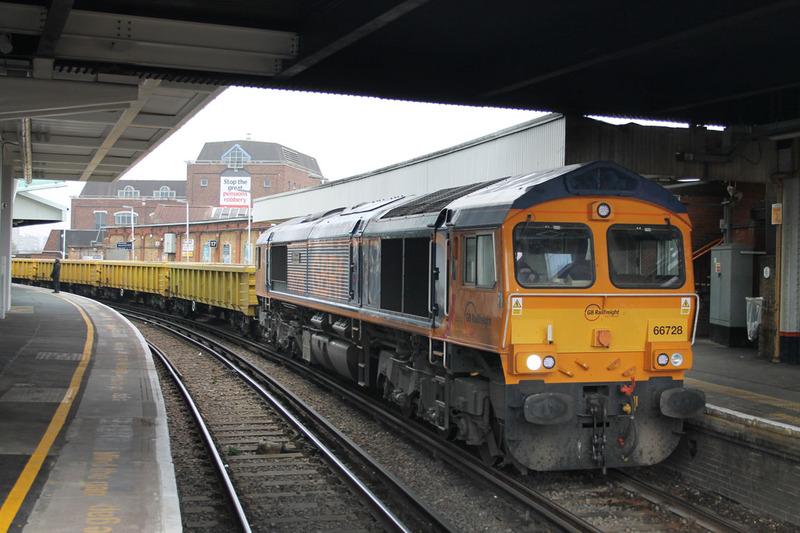 Four photos, from Mike Hopps, were taken on Monday 26 September, the first day of the current 'Waste by Rail' operation, with Loco No.66728 "Institution of Railway Operators". That above right was taken by Richard Emsley on Wednesday. Top: With the incoming "empty" train having brought in 300 tons of ballast for us, the L&W road-railer is seen unloading and spreading ballast on the siding (which will eventually form the running line). 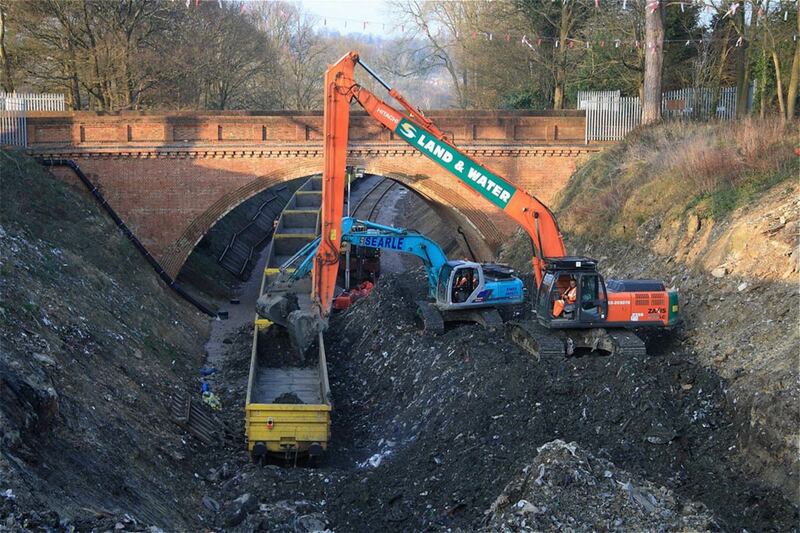 Some of the work over the last month has seen an access ramp created down from the tip site, under Imberhorne Lane Bridge, and a large quantity of the inert clay capping has been moved from the site to a temporary store alongside the running line south of the tip. Above right: The replacement loco, from the Wednesday, was 66731, and is seen here shunting the second "half rake" of wagons, with four already loaded. Below: The last two photos show the two diggers which were loading the train with waste. 25 August 2011: Handling the clay capping. 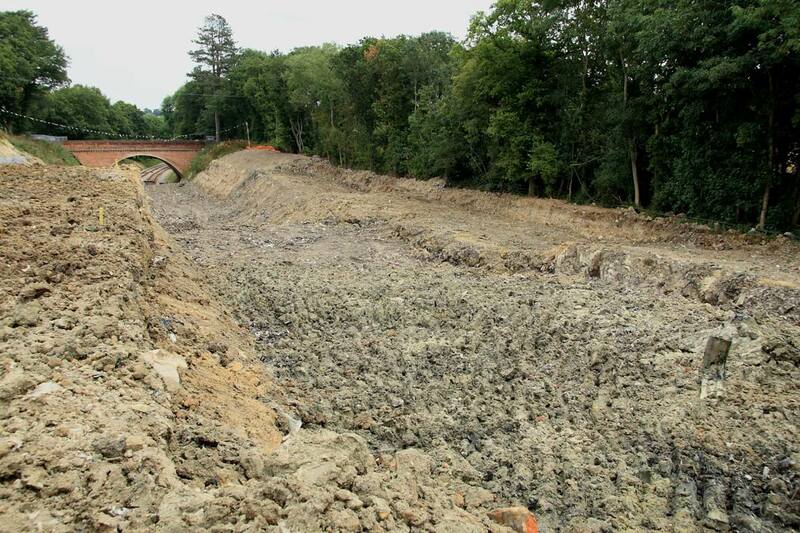 Over the course of WBR4 there will be a lot more clay capping removed. Robert Else's photo shows work in progress at the South end of the tip site on 25 August. 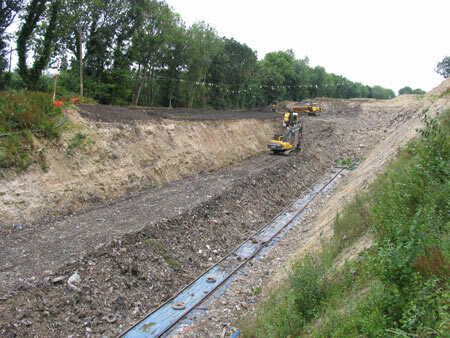 Access is being made from the tip surface to rail level in order to move clay capping to a storage point ready for future movement and use elsewhere on the Railway. This is part of planned clay reuse strategy. 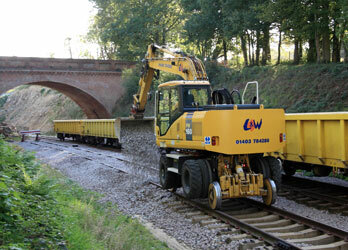 11 August 2011: Changes to the planned WBR 4 and 5. 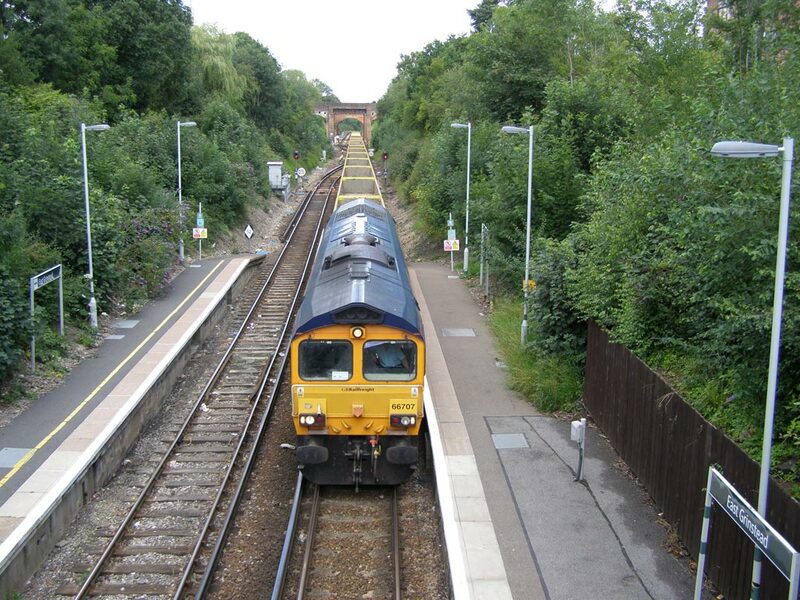 "Waste by Rail 4" comprising 2 weeks of train operation which was due to commence on 15 August is now to be combined with WBR 5, resulting in a 5-week run of clearance trains (commencing on 26 September) which equals 25 trains that will now operate under the "WBR 4" banner. There are economies of scale in combining these 2 phases resulting in savings to our mobilisation and plant costs and to our supplier cost base. 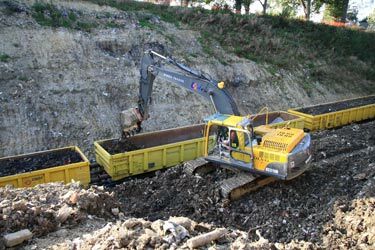 The waste will now go to a site near Didcot where it is possible to process the waste more efficiently than at the current landfill site. This destination is only available from September onwards. 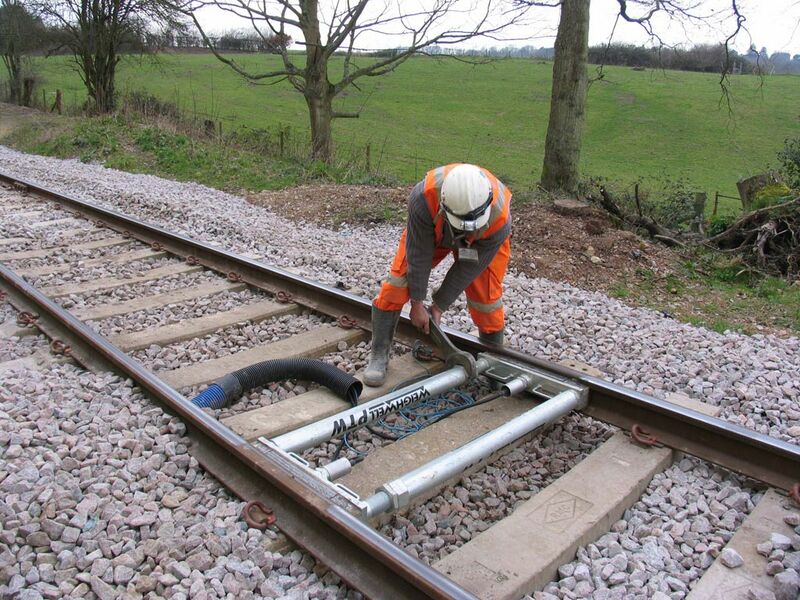 There is greater route flexibility and there are fewer engineering possession problems than on the WCML. Note there is no impact to train timings so far as we are concerned, which remain the same on the East Grinstead branch. Most significantly of all, we have agreed a £1/tonne reduction in tonnage costs as a result of these and other changes which means we are now using £24/tonne as the future budget baseline. 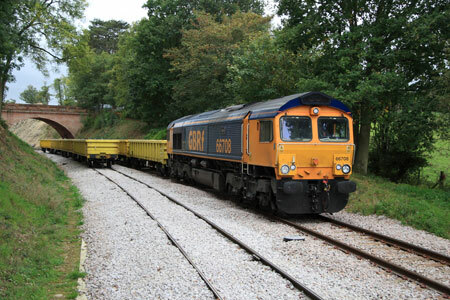 GBRF have assured us this time around we should be running with 20 wagon trains so an estimated 25,000 tonnes should be removed leaving a further 20,000 tonnes for the 'new' and hopefully last WBR 5 phase at a date to be finalised. However it is probably worth pointing out that it's "cubic metres" moved that really counts rather than tonnage, the latter varies considerably depending on the waste moisture content and density, these factors consequently impact on overall removal costs, so it is only possible to predict the density and not to guarantee it. 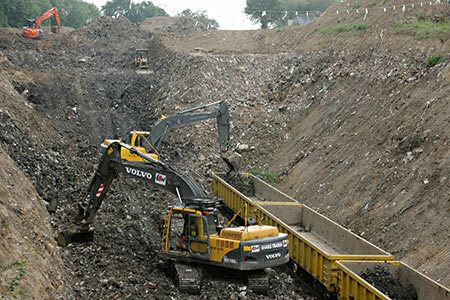 Negotiations with GBRF, Shanks and WRG (landfill operators) were only completed on Tuesday afternoon and as I am sure you will agree were worth pursuing in view of the potential savings to the project. Meanwhile, although the funding for WBR4 is in place and we are ready to go, do not forget we still need funding for the final WBR5. Mike Hopps' photo on the right above was taken during the early stages of WBR3 (the July dig) and shows the last two wagons of a half-rake being loaded - the half rake of 10 wagons is loaded 4, 4 and then 2 wagons at a time. On 11th July the loco was No.66743. As Chris points out, we still require a large amount of further funding to complete the waste removal by the end of March 2012, before Landfill Tax becomes payable. We therefore cannot let up on the fund-raising: Please do make a donation - it all adds up, and with your help we'll achieve our target. 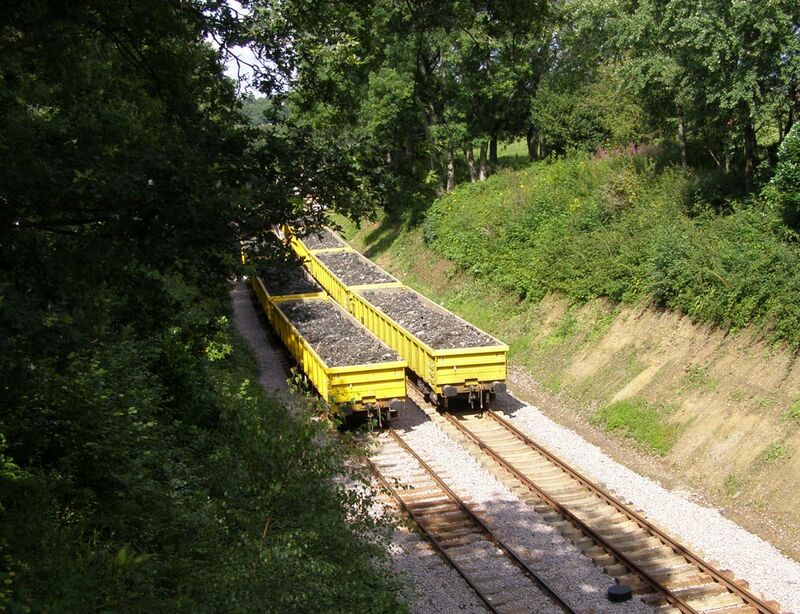 Mike's photo below shows a view of the loading taking place on 15th July as seen from the loco's rear cab. 26 July 2011: Report on the completed "Waste by Rail 3" operation. 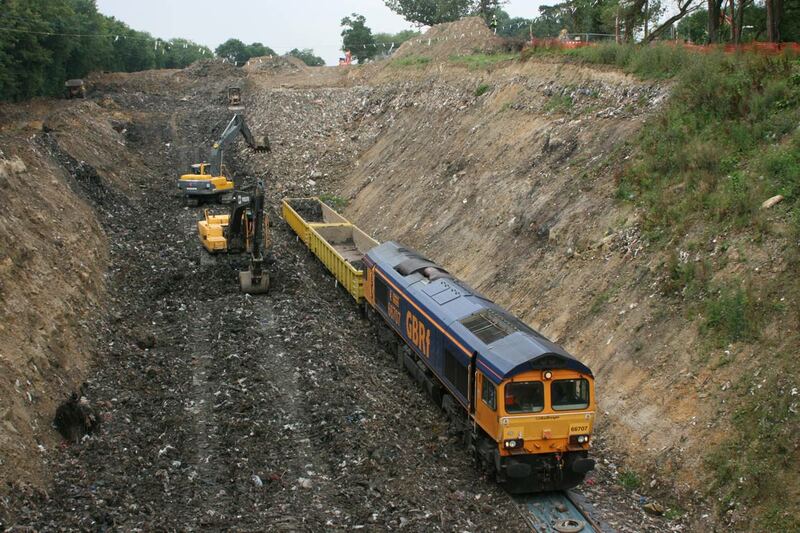 WBR 3 ran successfully between 4 and 22 July with a total of 14,567 tons of waste departing by GBRF trains for the Shanks landfill site at Forders in Bedfordshire. As with WBR 2 the operation ran according to plan the only disappointment being the absence of one wagon in the train which meant over the 3 week period we ran with only 19 wagons which resulted in the loss of the equivalent of nearly one train over the duration of the works. With typically British July weather resulting in heavy rain on some days, the contingency plan for loading in wet conditions kicked in and no time losses occurred. In fact the loading times overall improved against the WBR 2 timings with the train generally being ready by around 18:00 each day. 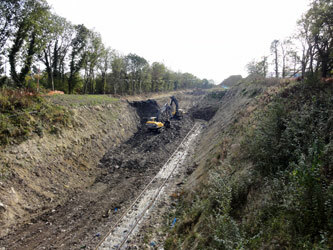 For a number of technical reasons the partial excavation strategy now being adopted means the removal works are being concentrated on the eastern or down side of the cutting. 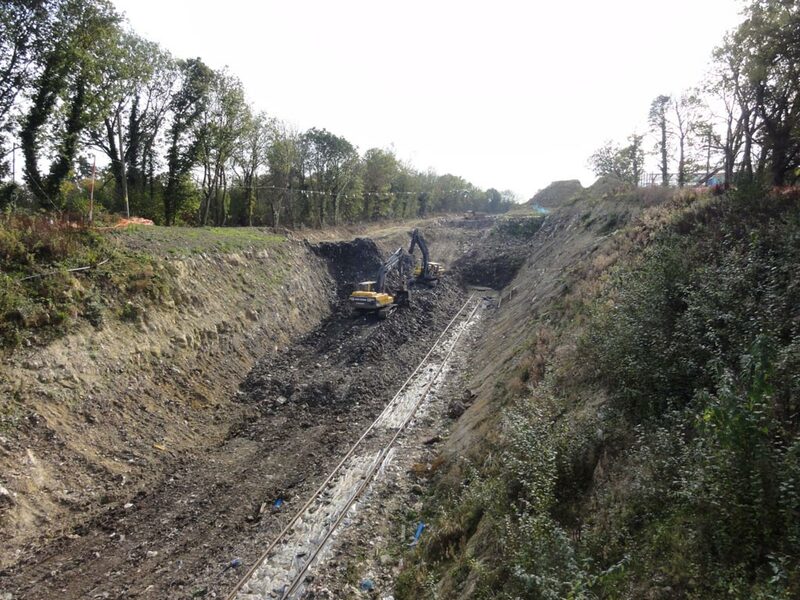 This does not mean the work prior to this phase has in any way been abortive, once the route through the cutting is cleared it will become evident how the final track alignment will be positioned and the residual waste is to be managed. WBR 4 is scheduled to commence on 15 August and will run for only 2 weeks as currently planned but this may change nearer the date depending on train paths. In the meantime work will continue on site striping off the top layer of clay capping and stacking this to one side for future use on the railway. In financial terms the budgetary cost of £25 / ton remains accurate so the overall cost of WBR 3 will be around £350K. Roger Kelly reports the response to Bluebell News and special fund raising DVD had been encouraging with a steady flow of contributions, however there is still much to do so please contribute anything you can spare and of course a big thank you to everyone who has dug deep, especially the 'Chit Chat' group on Yahoo! who have almost funded 2 complete train loads and will have a train departing carrying their own special headboard on the class 66 locomotive to mark the achievement. Above report: Chris White, July 2011. 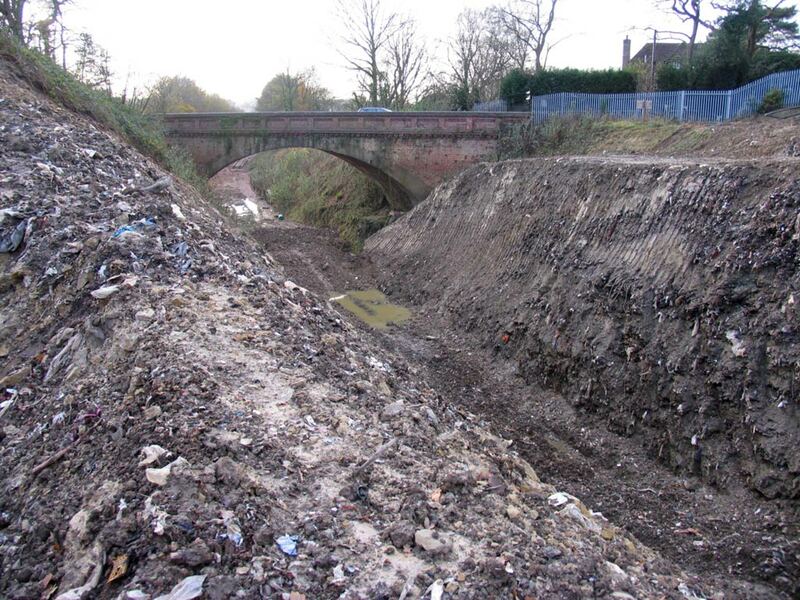 We still require further funding to complete the waste removal by the end of March 2012, before Landfill Tax becomes payable. Please do make a donation - it all adds up, and with your help we'll achieve our target. Stephen Fairweather's photos above, taken on Saturday from on top of the tip show the view from the "far" end of the dig, compared to the usual vantage point on the bridge. The scale of the hole dug is hard to see from either end, with the distorting effect of the camera lens, but Tony Sullivan's on the right shows quite well the size of the hole excavated in the last 3 weeks, stretching into the tip on the East side, which is now the focus of attention. 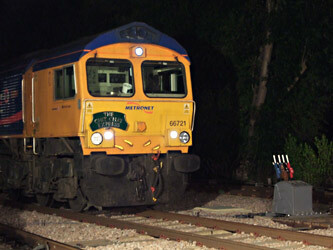 That and the first photo below illustrate the loading of the train on the last Thursday of WBR3 at Imberhorne Tip. James Michell's photo, taken at dusk last Friday, shows 66707 heading the very last of the WBR trains north from East Grinstead. A series of photos was taken on Tuesday 26th July by Mike Hopps. 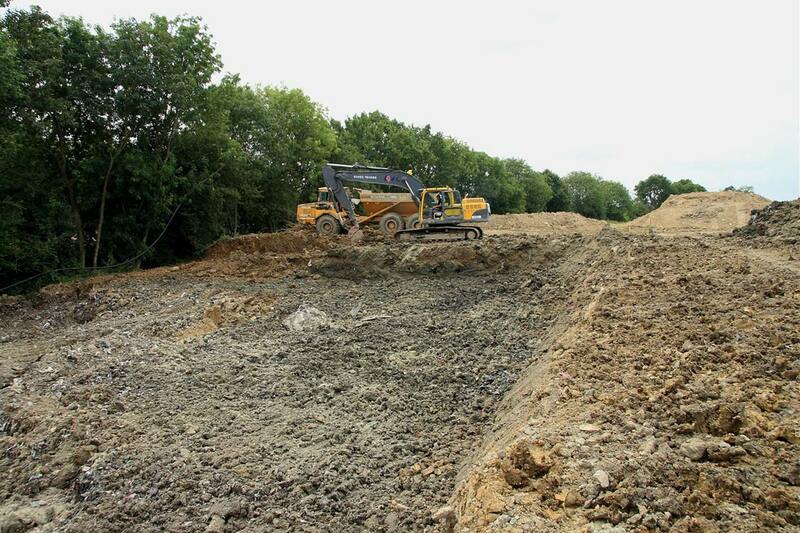 The photo on the right shows the work on the tip is continuing this week, with the removal of further clay capping from the line of the dig, in preparation for the resumption of digging on 15th August. 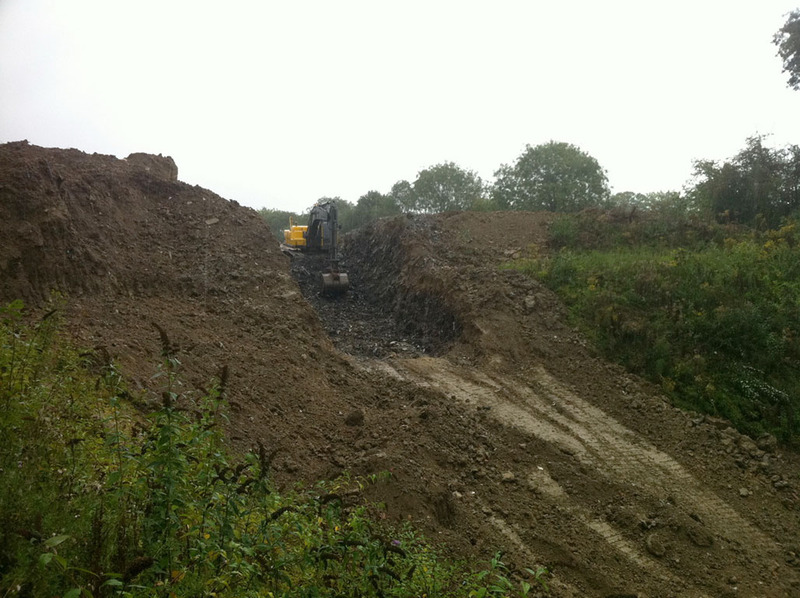 1) The view looking North with dumper moving clay to the western edge. 2) The view of Imberhorne Lane Bridge from the top of a pile of clay at the south end - just shows how high these clay piles are! 3) Digger moving clay spoil westwards at the south end - yellow pegs mark the extent of the western edge of the planned line of the cutting. 4) Looking North from approximately the new tip face, showing the extent of the dig from the last three weeks - yellow pegs again marking the new western boundary. The dumper road clearly shown on the eastern edge above the cutting rock face. This road is used by the dumper to deliver the spoil to the train because they were getting too many punctures when running the dumper over the rubbish! The eastern edge will eventally be finished neatly with clay as shown in the background near the bridge, when the job is finished. When viewed from Hill Place Bridge (which is where most of the photos are taken from) the further away you are from the diggers, the less appears to have been dug out because of perspective! Looking this way you can see that quite a lot has disappeared since the last dig. 5) Looking south with the digger removing clay capping and the dumper moving it westwards, away from the line of the dig. 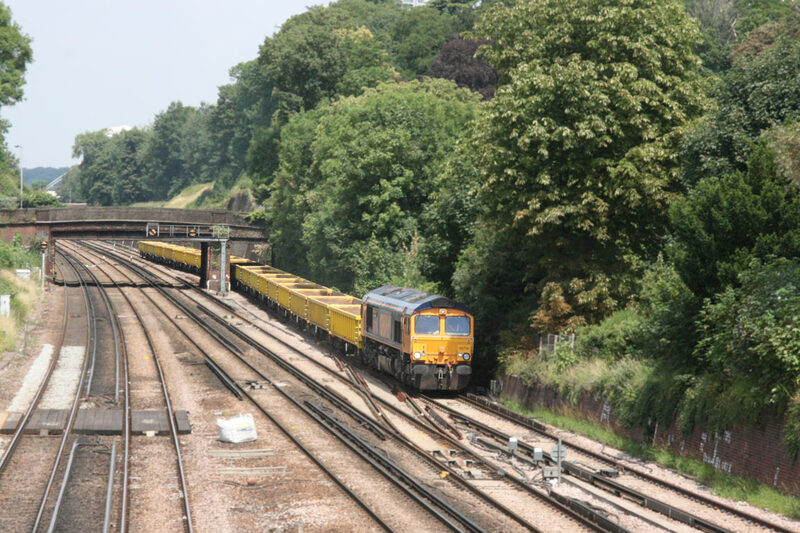 Malcolm Porter's photos below from last Friday show the last day of the "Waste by Rail 3" operation, with the incoming empties approaching East Grinstead, held awaiting the departure of an up train, then 66707 heading the train through the station platforms. The third photo shows the last consignment of waste of the current batch awaiting collection. 15 July 2011: Report on the first week of the current "Waste by Rail" operation. 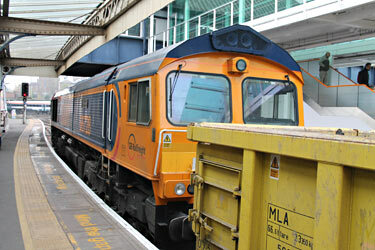 Waste By Rail 3 (WBR3) started on 4th July 2011 and is scheduled to run for three weeks. Unfortunately the planned rake of 20 MLA wagons was reduced to 19 as one was "red carded" before it arrived. For a number of technical reasons the waste removal is being concentrated on the down (east) side of the cutting. During the first week a total of 4880 tonnes was removed, but it is important to understand that it is less about weight and more importantly the volume of waste removed. This current phase of the project is planned to run until 22nd July. 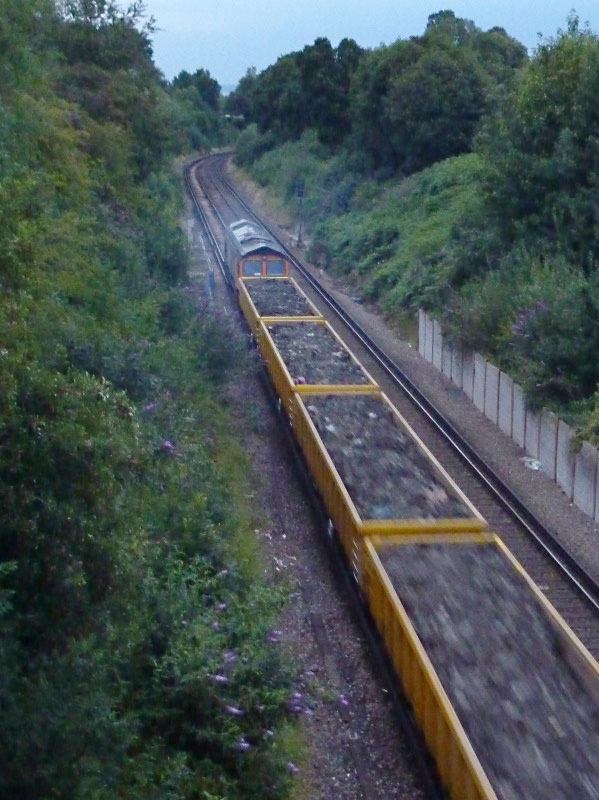 James Chatwin filmed a full "Waste by Rail" train at speed, late in the evening from the bridge at Lingfield Station on 6th July. The photo below from Pat Plane shows wagons 9 and 10 being loaded last Friday. 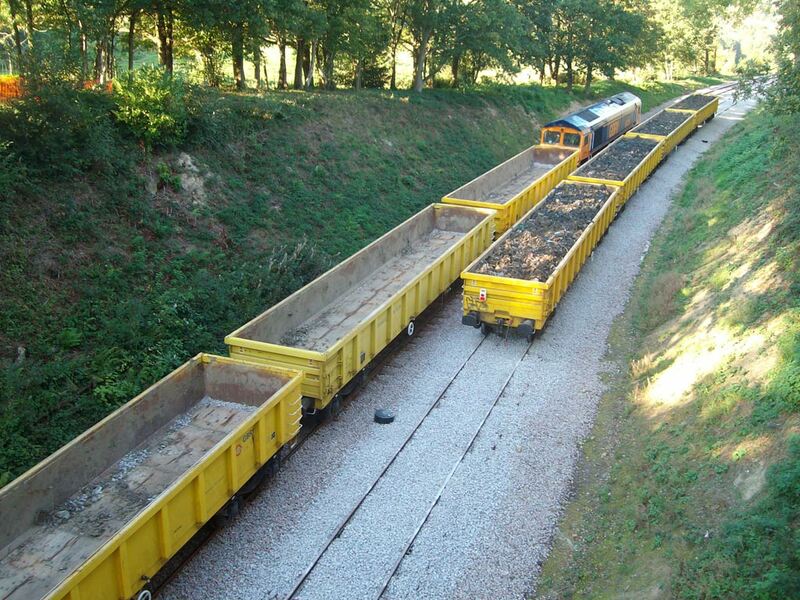 The rake is split into two halves (10 wagons), and then, since we can fill up to 4 wagons at a time, further divided down into 4 and 2-wagon sections for filling. 4 July 2011: The start of another 3-week "Waste by Rail" dig. 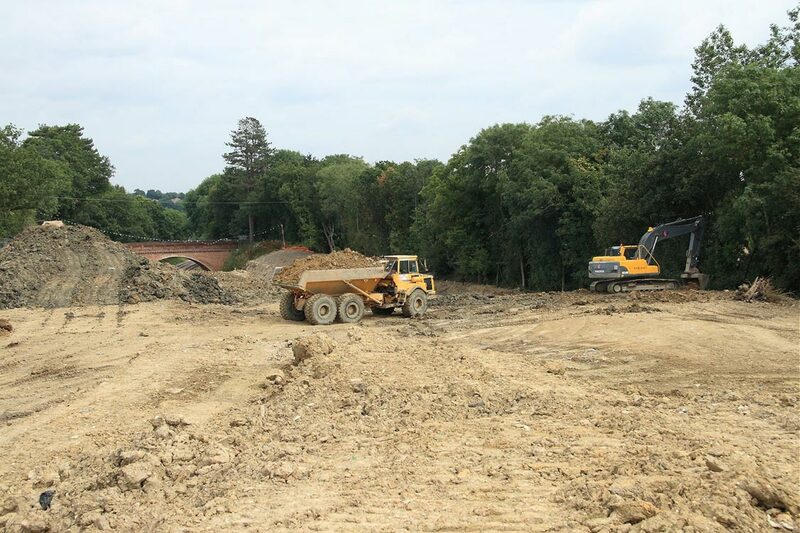 Over the last couple of weeks work has been taking place at Imberhorne to prepare the site for further waste removal, by the removal of more clay capping. Then on 4th July we started three weeks of waste extraction (with more to follow in August and September). We are now using 20-wagon trains (rather than 18), to enable (hopefully) a full 1000 tonnes of waste to be shipped out each day. A full report on the experience gained in the March dig and the subsequent sorting trial, and details of future plans, will be included in the forthcoming edition of Bluebell News. To remove the remaining rubbish blocking our extension to East Grinstead we still need your support - there are many different ways to help! 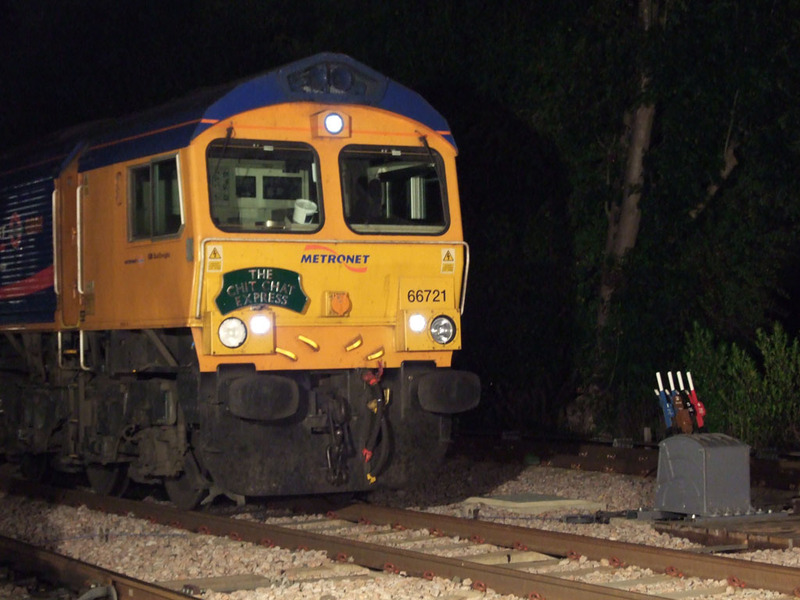 These two photos, from Derek Hayward (right) and Tony Sullivan (below) show GBRF loco No 66714 "Cromer Lifeboat" at Dunton Green and South Croydon, with the incoming train of 20 empty wagons on 4th July. 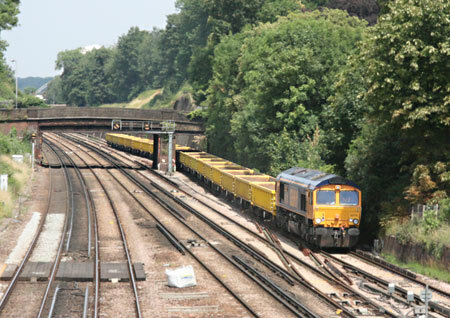 The second photo, below, from Martin Lawrence shows a half-rake of full wagons at Imberhorne North on 5th July. 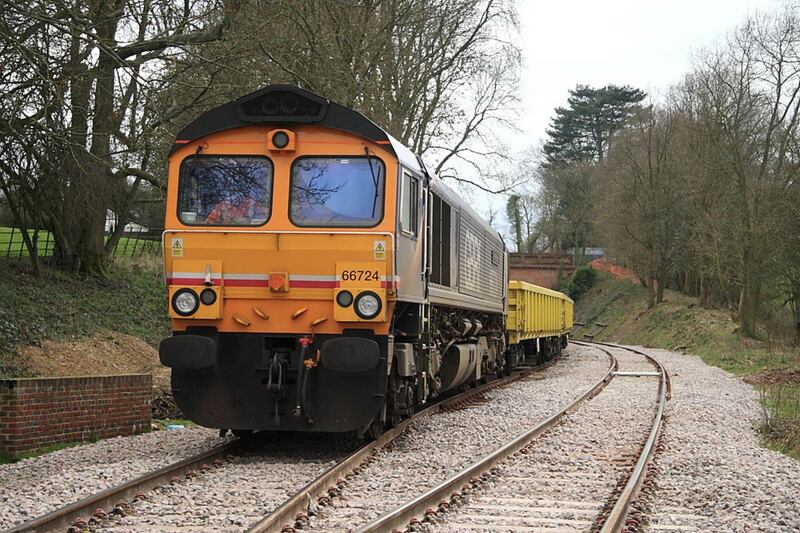 "Waste by Rail Phase 2" (WBR2) was completed on Thursday 17 March, with an additional 3731.40 tonnes of waste being removed from the cutting that week, giving a total for the nineteen days of 16,871 tonnes. 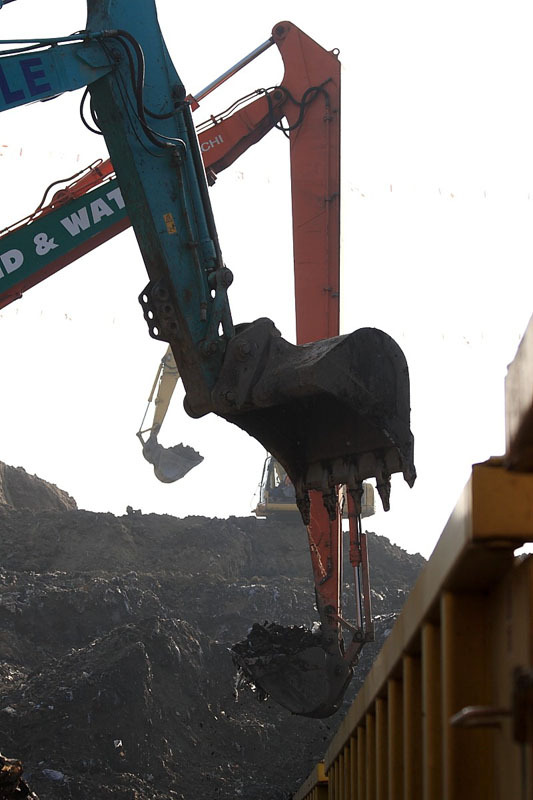 Over the following days the track was further extended to the tip face, and the site closed down pending sufficient funds becoming available to finance further waste extraction. 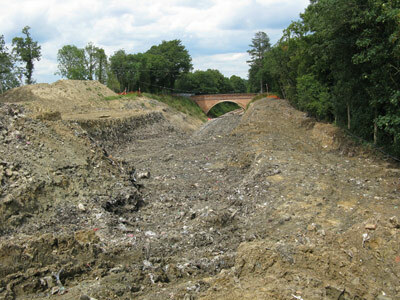 It is imperative that as much of the waste in the cutting as possible is removed before 31st March 2012 after which any waste remaining in the cutting will be subject to Landfill Tax the impact of which is to raise the cost per ton to clear the tip from £25 to over £90. If you wish to support this project please see the 50th Anniversary Appeal - you can also make on-line donations through Paypal (both of these options enable Gift Aid), or for smaller sums, "Tenner for the Tip" certificates are still available. With the 3% additional "transitional relief" on Gift Aid coming to an end on 5th April, anyone considering making a donation to the appeal to complete the extension might consider doing so in the next few days. A video appeal is currently being prepared. The photo on the right, from Patrick Plane shows the site on Thursday 24th, with track extended. 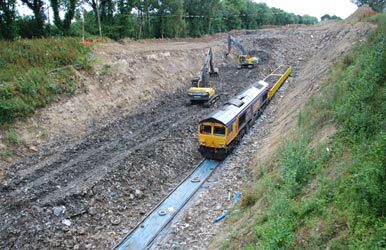 Those below (from Stephen Fairweather and Nigel Longdon) show the situation on the Saturday after the end of the dig, but before the additional track-laying had been completed. 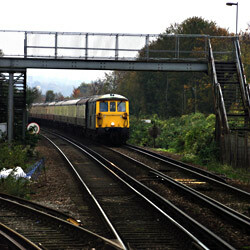 Shuttle trains will run over Hill Place Viaduct to Imberhorne North with our 4VEP unit number 3417 "Gordon Pettitt" hauled by a Class 73 electro diesel locomotive. Train services will depart East Grinstead every half hour from 10.10am until 4.40pm, and the second edition of our East Grinstead Station Guide is now available. Further details here. The Bluebell Railway will be holding a special evening for shareholders and local residents of East Grinstead to view the progress in the removal of the waste from Imberhorne cutting at first hand. It is envisaged that, following an extra day's digging, the spoil train will be at East Grinstead on this special evening and will depart at 21.10 hours as usual. 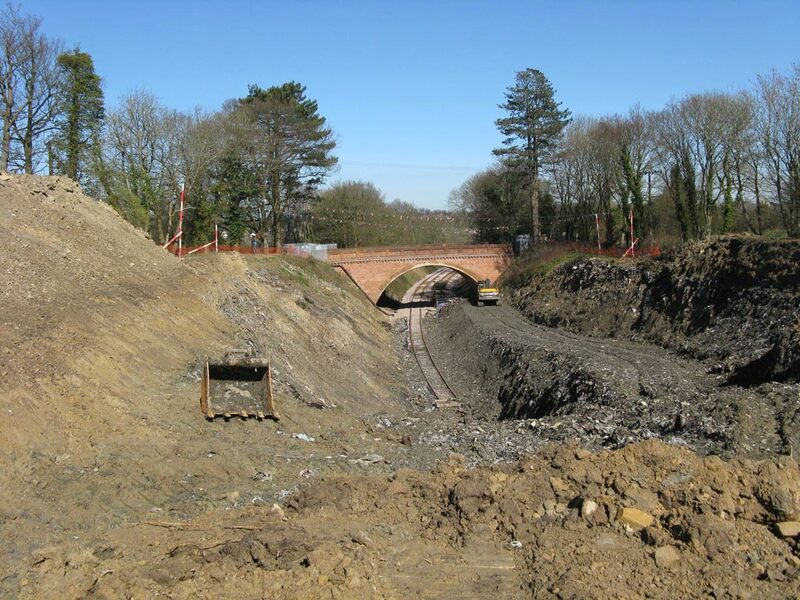 There will be a special train from our East Grinstead station to the north end of Imberhorne cutting where special arrangements will be made for you to leave the train and walk to the north end of the cutting and view the progress for yourself. 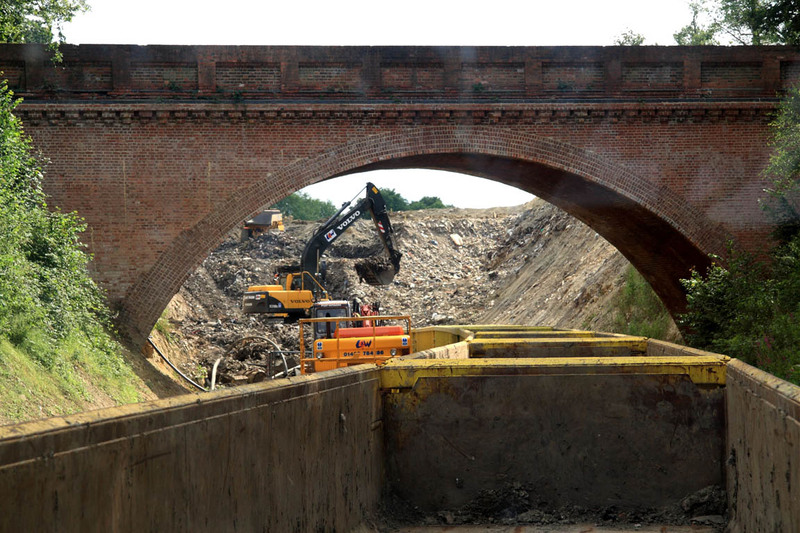 The station will be open from 5.00pm until 9.30pm with half hourly shuttle trains from the station between 5.00pm - 7.30pm, over the ten-arch Hill Place Viaduct, to the north end of the cutting. More details here. An important way we plan to raise the funds required to complete our extension is as the major part of our 50th Anniversary Appeal - please support us by making a donation. Bluebell Railway plc shares are available for purchase from the Society's holding. Details are available for how to purchase shares by instalments, or with a lump sum payment. 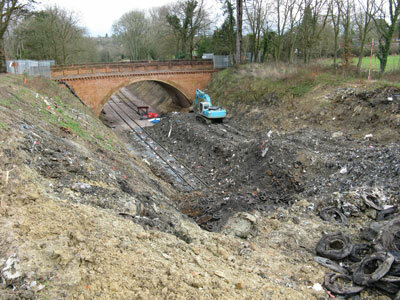 See also a trackbed tour from Kingscote to East Grinstead, and the Interactive map of the Extension, which shows how the tracklaying proceeded north from Kingscote. Yet another 5 trains of waste leave, and we lay still more track into the cutting. 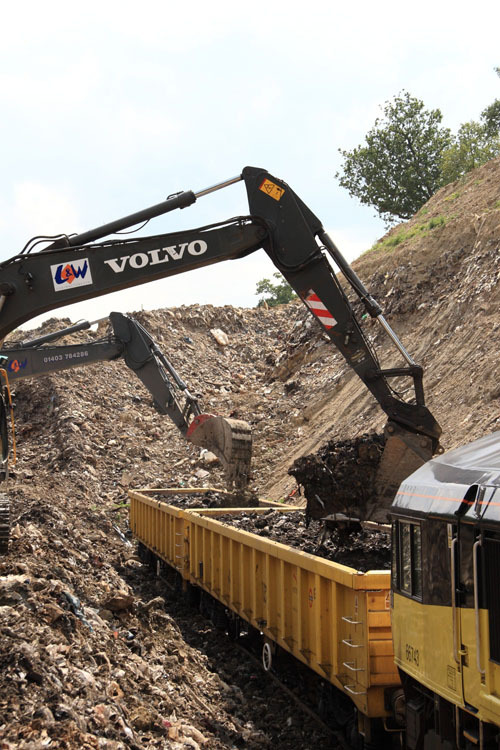 During week three of the current phase of excavation a further 4605 tonnes of waste was removed by rail bringing the total for the current phase to a shade under 13,140 tonnes. 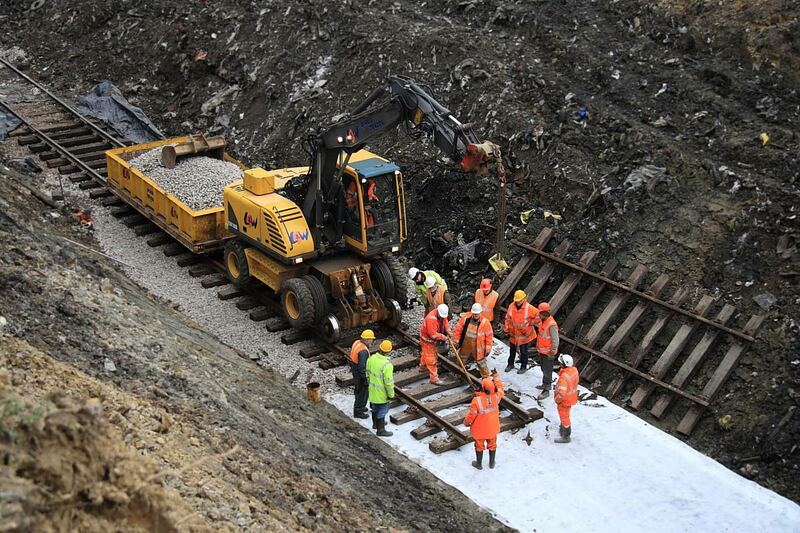 On Saturday 12th March a further short panel of track was laid towards the retreating tip face. There will be four more days of excavation during the coming week after which there will be a review of this phase. Another 5 trains of waste leave, and we lay more track into the cutting. 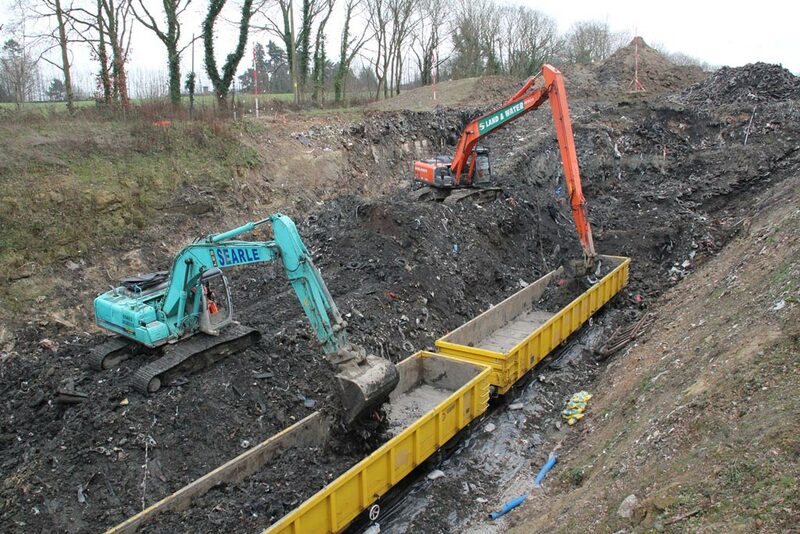 Week two of the current phase of excavation of waste achieved another 4487.45 tonnes removed by rail. 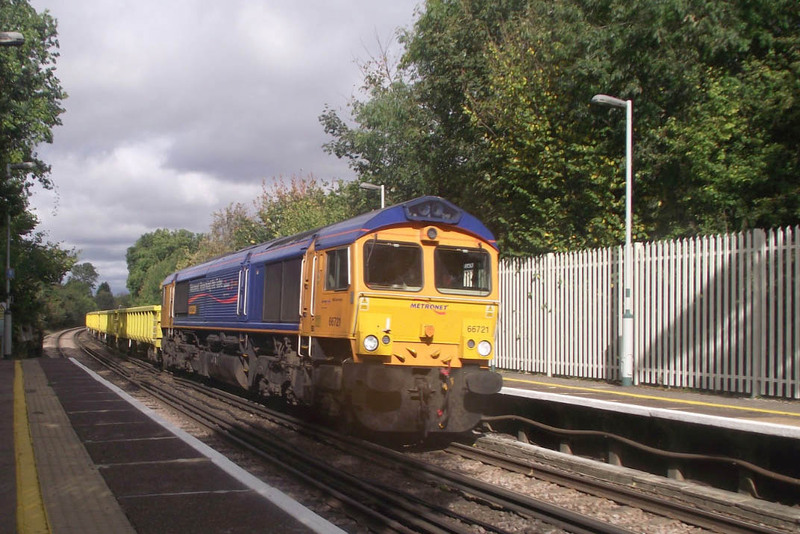 This figure is close to the maximum achievable with eighteen wagons given the load restrictions on the route between East Grinstead and South Croydon. 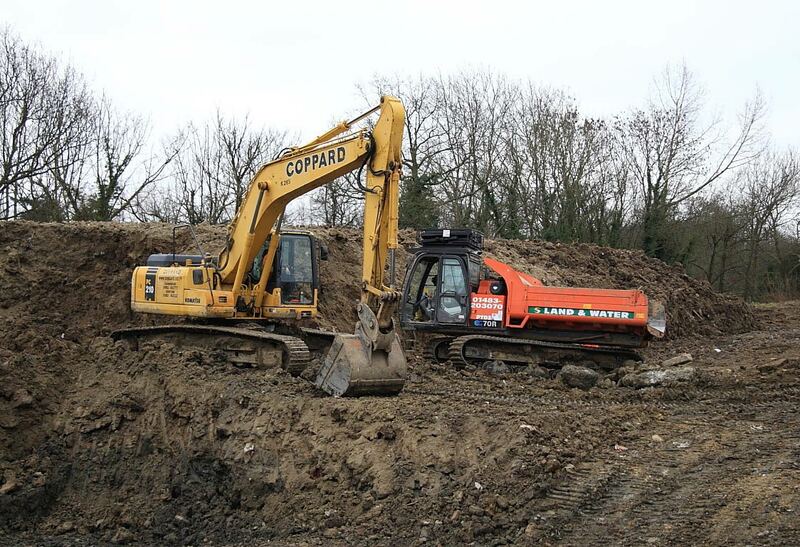 An additional excavator and tracked dumper have worked during the week on top of the tip moving the redundant clay capping and tyres that appear to form a layer within the formation of the tip. On Saturday 5th March the railhead was extended towards the face of the tip by approximately 66 feet using pre-assembled short track panels. 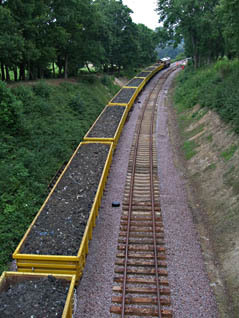 Prior to laying the track a sandwich of polyethylene and terram is laid on the prepared trackbed to prevent pumping of clay through the ballast. Once laid the track panels are covered with polyethylene sheet to protect the ballast from contamination during the loading process. Three wagons can now be loaded alongside the waste. On Monday 21st February we started a scheduled nineteen day excavation of Imberhorne cutting. 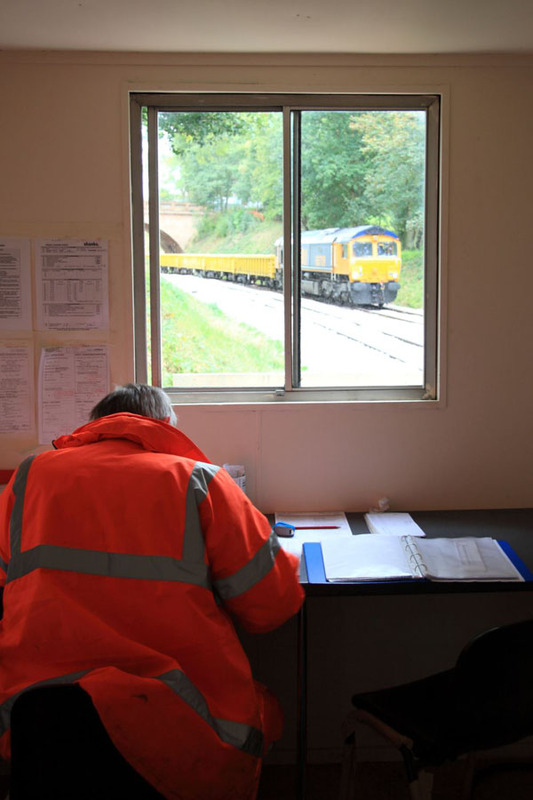 The first day was not expected to be a "normal" day as we needed to load waste that had remained trackside since the trial by rail last July, however, we had the added challenge of having to empty most of the wagons that were partially filled with ballast. 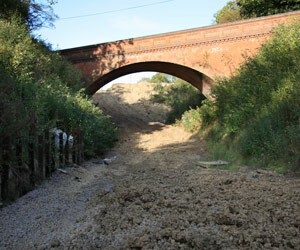 The consequence of this was that only nine wagons were dispatched at the end of the day. From our experience on day one it was apparent that one excavator was unlikely to be able to load all the wagons in the time available so a second was added and has been used since, even so it is still quite tight to load the wagons before the train has to be reformed prior to departure. How have we done in the first week? 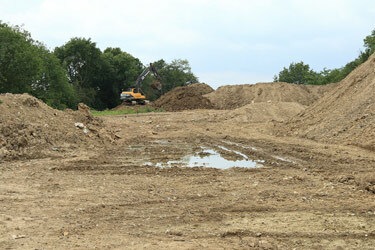 A total of 4047.2 tonnes was removed from the tip. Overall the first week is considered to be a success and went much as expected with some initial teething issues to resolve but with an overall tick in the box and a satisfied NEP team who went home Friday after a challenging but very rewarding first week. 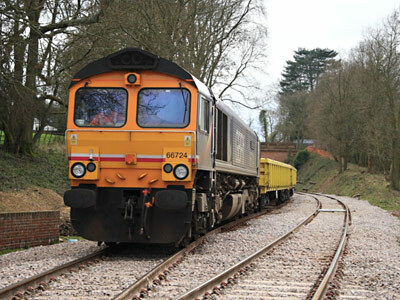 The final touches are being put in place for the four week "Waste by Rail" run which commences on 21 February using GBRF trains to move the domestic waste from Imberhorne cutting to Shanks landfill site in Bedfordshire. 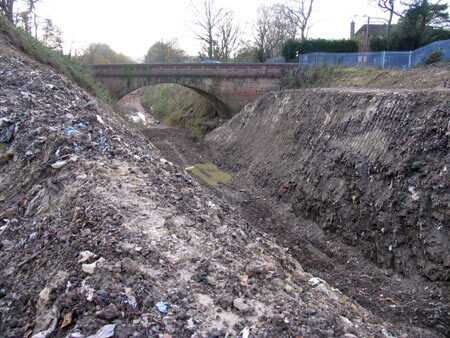 Assuming all goes to plan this will move 1000 tons of waste each weekday from the western (upside) of the cutting totalling around 20,000 tons over the 4 weeks although factors such as waste density and type can influence the volumes and hence the actual weight of the material moved. 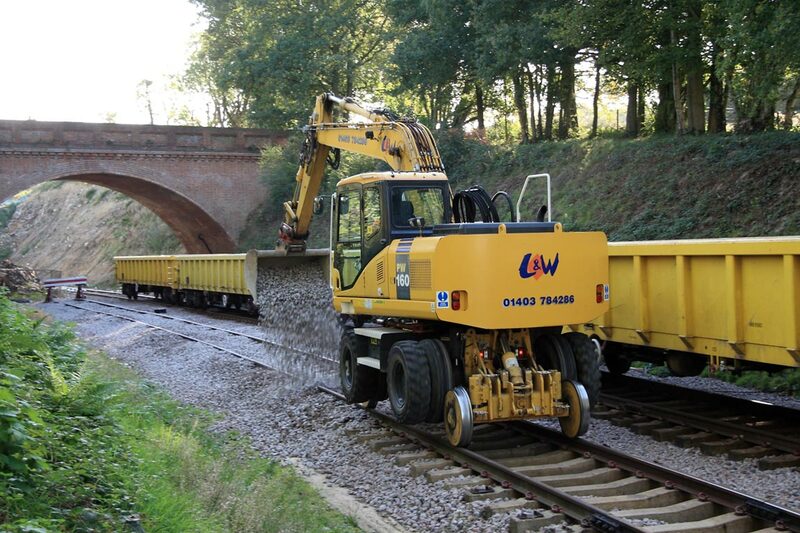 This is a lean and mean operation with the main contractor being Bluebell Railway itself hence responsibility for site management, health & safety, sub contractors and project risk along with overall success rests entirely with us. 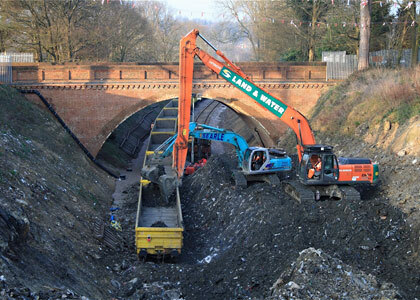 Land & Water of Guildford were the main contractor for the previous two trial phases but we have now learned enough to run the project ourselves thereby making a considerable saving on the overhead costs incurred by employing a contractor to do the job for us. Volunteer involvement is also much greater this time, each working day involves 4 trained volunteers to manage the train movement and loading activities, some of these duties take place late into the evening but this 'free' contribution is key to success and again helps to keep down costs. 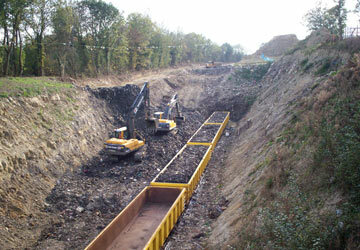 Generally only one long reach excavator will be in use to manage material movement and loading although this will be supplemented by additional plant if necessary for peak movements, this compares to 2 or 3 excavators and 3 tracked dumpers involved in double handling the material last time. For those interested in train movements, the empty train will arrive each day at 1330 and depart at 2110 but please be aware site access from now until completion of the waste removal and re-connection of the railway between Kingscote & East Grinstead will be limited to persons issued with a Site Permit except for open days when the station will of course function as a operational railway and special arrangements apply. Page maintained by Richard Salmon with thanks to Nigel Longdon, Tony Sullivan, Barry King, Chris White, Patrick Plane, Stephen Fairweather, Nathan Gibson, Greg Wales, Gordon Callander, Robert Hayward, Brian Kidman, John Sandys, Chris Knibbs, Mike Hopps, Martin Lawrence, Richard Emsley, Robert Else, James Michell, Malcolm Porter, Derek Hayward and David Hewitt.